I went to West Danby last night to hear a presentation that seems very relevant to issues in Dryden. Fernando de Aragon, the Executive Director of the Ithaca-Tompkins County Transportation Council, gave a presentation - which in many ways was a conversation with attendees - on calming traffic on rural roads. Fernando de Aragon presents rural road calming strategies at the West Danby Community Association. Aragon noted that highway design has changed a bit over the past few years, as more people have to realize that having a single model for roads designed to get the most traffic through isn't appropriate. He noted two publications in particular, Design Guides for Rural Roads and Flexibility in Highway Design, as providing other options for highway designers. a philosophy wherein safe transportation solutions are designed in harmony with the community. CSS strives to balance environmental, scenic, aesthetic, cultural and natural resources, as well as community and transportation service needs. Context sensitive projects recognize community goals, and are designed, built and maintained to be sustainable while minimizing disruption to the community and the environment. 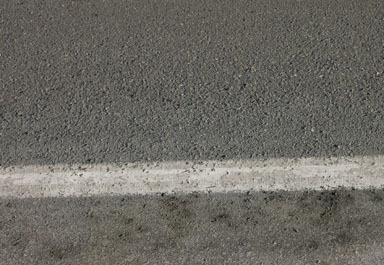 Traffic calming techniques (which may be part of CSS but can also be done separately) make drivers slow down by presenting drivers with minor challenges rather than by putting up speed limit signs or traffic lights. 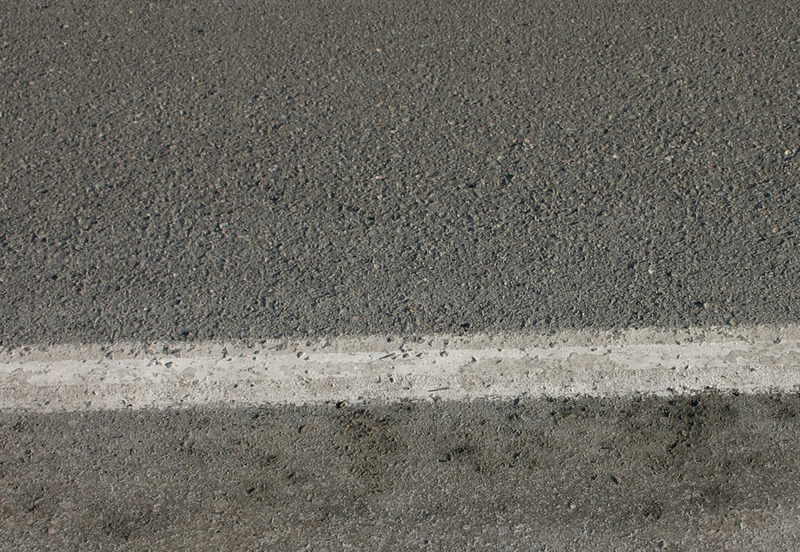 Speed bumps and speed humps are classic calming tools, though they work poorly at higher speeds and can cause problems for heavy vehicles, including emergency vehicles. 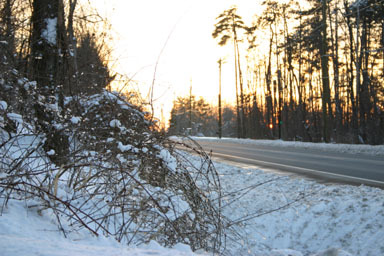 More sophisticated approaches (which require rebuilding the road) can use more subtle shifts in the banking and elevation of the road to make drivers wary. Reducing the driver's field of vision with shrubs and bushes or increasing the amount of horizontal shifting they have to do can also help. The West Danby residents were largely concerned about NY Route 34/96, which has seen a number of chemical spills and which presents residents with a wide variety of challenges at intersections and driveways. The volunteer fire station there has strobes to warn drivers of emergency vehicles coming out, but that's not a widely-available strategy for getting people out of their driveways. West Danby volunteer fireman John Smith did note, however, that 34/96 may already have a traffic-calming effect because of its relatively higher number of curves and warning signs, and it apparently has a much lower rate of fatal accidents than the straighter routes 13 through Newfield and 96B through Danby. Many people there still perceived speeding to be a problem, particularly during rush hours. As Aragon noted, Tompkins County employs about 14,000 people from surrounding counties, which creates much larger commuter pressure than most counties have to deal with. Joel Gagnon asked how to talk with the state about the road. Apparently towns can go directly to the DOT with concerns about state roads, while they have to go to the county and the county to the DOT for county roads. Aragon suggested assembling a report on the road, noting problems and intersections and collecting data on traffic volumes and speed. Apparently the Town of Ithaca has invested in a traffic measuring device that collects speed information as well as counting the number of cars that pass, though an attendee noted that people tend to slow down when they see the black ropes across the road. Aragon emphasized that hard data makes it much easier to get a case through the DOT. In particular, he noted that "Safety is one of the key ways of tickling New York DOT." Speed enforcement is a challenge on 34/96 as there are few places for police to hide and few places to pull drivers over safely. Parking cars that look like police cars along the road was one suggestion, but without a village and the dedicated police that brings - I think that the police force in the Villages of Dryden and Freeville, for instance, has a substantial impact on speeds on their roads - enforcement is both spotty and has its own substantial costs. Polley Smith suggested that signs welcoming people to West Danby might at least let people know they were in a place with population, and could combine beautification and a sign of community with some hope that drivers would slow down. (Varna is working on something similar.) Aragon said that it couldn't hurt and might help. There was also a suggestion of putting in pedestrian crosswalks, but apparently crosswalks without lights give pedestrians a false sense of security while not changing drivers' perspectives very much. I can't say I left the meeting feeling too optimistic about changes to our road structures that will make it any easier to sustain communities here, but it was a very impressive evening. Community associations or even the Town Board here might want to schedule a similar session, as it really cleared up a lot of questions I had about who is responsible for roads, what can be done to modify roads, and how the balance between throughput and impact on a community gets looked at these days. At last night's meeting in Danby, Fernando de Aragon mentioned that the state Department of Transportation publishes traffic count data. The latest data available is from 2002 (3784K, PDF). I've pulled information out of those enormous tables, focusing just on New York State roads (13, 38, 79, 366, 392) in the Town of Dryden. The numbers reflect the Annual Average Daily Traffic (AADT), the "number of vehicles... traveling over a designated section of highway". I've tried to make the road identifiers more readily intelligible. The data is kind of messy, in that different road sections get measured in different years, so each count has a year number (or "est" for estimated) next to it. Cathy Wakeman's Dryden Town Talk for today explores winter recreation opportunities for adults, including swimming at TC3, adult indoor soccer, and unsupervised ice skatiing at Montgomery Park (directions). 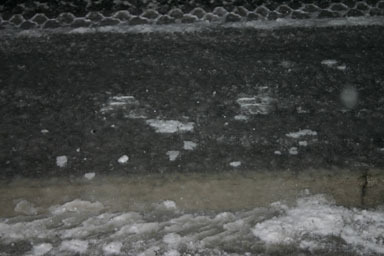 Bring your own shovel and enjoy old-fashioned ice! Continuing down Route 366, we come to an area which mixes commercial and residential development. The first sign of this is The Antlers, a restaurant which seems to stay very busy. I'm especially partial to their cheese and crackers with cocktail sauce and to their corn pudding. The main courses are tasty too! Elsie Gutchess sent a letter that she's also sent to the Cortland Area Tribune, asking for help with planning and putting on Dryden Old Home Days this year, at the pavilion at Dryden Lake Park July 31st and August 1st. Highlights of last summer: We had a good turnout of visitors, the community merchants donated great prizes and awards, young children participated in races, local papers gave us great coverage, we ate and drank, boated on the lake, sang and danced, took wagon rides, raced, meditated, exercised, walked the trails, and visited. The expenses were covered by a Community Celebrations grant from the County Tourism Board. I have many ideas to make this a great event for all Drydenites and visitors, from children to seniors. But I need the help of the community to plan and stage this event if it's to continue and possibly to become a yearly event. Please contact Elsie (drydentownhistorian@cny.net) if you're interested in helping. Today's Ithaca Journal reports that the Dryden Board of Education authorized planning for replacing the modular music and science rooms with permanent structures, keeping the proposal on time for a June referendum. They also looked at costs for next year. There's also a letter commending retiring board member Larry Chase. I've had a few questions about who I am and why I'm doing this, and it seems like a good idea to explain that a bit. Until fall 2003, my main political activities since the 1988 Dukakis campaign (when I volunteered on the campaign) had been reading and voting, with an occasional letter to the editor. I started looking at local politics, and saw issues there which deserved a lot more attention than they usually get. I decided to get involved in the 2003 elections, and made a lot of get-out-the-vote phone calls, which apparently didn't get out enough votes. Rather than disappear into the woodwork when the Town Board elections produced a completely Republican board, I decided that it would be good to have a place to look at what happens in Dryden that was published regularly, and could go into greater detail when necessary than is possible in the Ithaca or Cortland papers. I worry that the general lack of news makes it much harder for anyone to discuss issues at election-time, as too many people haven't followed local news and, well, there's a lot to explain. I've lived in Dryden since December 1999, at 1259 Dryden Road. I grew up in Corning, forty miles down the road, and my parents still live there. I'm a registered Democrat who happily volunteered for and donated to the Dryden Democrats last year. 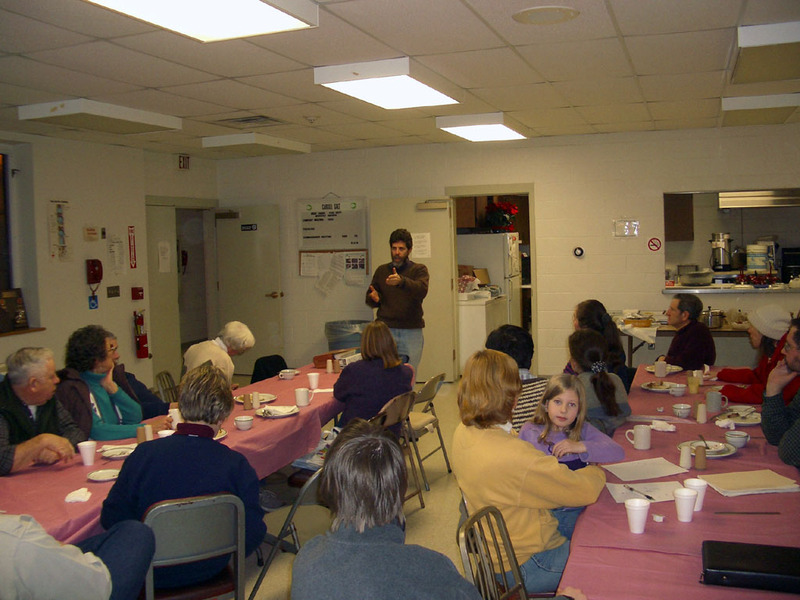 I joined the Town of Dryden Democratic Committee in January 2004, and became its Chair in April 2004. I retired in December 2008, was Vice Chair for a while, and then was Chair again until November 2010 As of September 2011, I'm Vice Chair again. I ran for Town Board in 2009. The Committee has its own mind(s), so it's not wise to treat what I write as any kind of voice of the Committee. I've also been working with TC Local, working toward figuring out what Tompkins County might look like if energy prices increased dramatically, and I'm currently Chair. That mostly means drawing up agendas and running the monthly meeting. Again, what I write does not represent the opinion(s) of that group. As of December 2011, I'm a member of the Varna Community Association Board, who very likely don't endorse anything I write here. I'm also a retired Trustee of the Dryden Town Historical Society. I attend Ithaca Monthly Meeting of the Religious Society of Friends and write a blog on Quakerism as well. I edit (and occasionally write) computer books for a living, working at home for O'Reilly & Associates, a company whose primary offices are in Sebastopol, CA, and Cambridge, MA. I've spent my last few years focusing on the (now declining) subject of XML, as you can tell from my personal site. My resume is a few years out of date, something I'll get around to fixing. I'm serving (2010) on an advisory board for a Cornell Lab of Ornithology citizen science project, but otherwise I have no affiliation with Cornell University. There is no advertising on this site, and I don't plan to accept any. I personally pay for all funding for the site's activity, including the web site itself, things like cameras used to take pictures, and software used to maintain the site. The opinions expressed on this site, unless cited explicitly to someone else, are my own. The one gift I received related to a story on this site was an orchid from The Orchid Place in October 2006. They also let us use their parking lot sometimes. While driving through Varna the other day, I noticed a house with a Century 21 sign in front of it. I was curious how much it cost relative to the rental properties I'd noticed last month, so I looked it up. Its asking price is $85,500, much less than the buildings up the road. It's also marked "Sale Pending". I also noticed that a property near mine, the Plantation Inn, was listed for sale at $140,000. I wish there was an easy to search real-estate listing by municipality, though it seems like in practice people look by school district and sometimes zip code. Also, the Ithaca Journal reported on 2002 median selling prices for homes last Friday (in its print-only Outlook 2004 section). According to the Ithaca Board of Realtors, the median selling price for homes in the Town of Dryden was $119,250, in the Village of Dryden $98,500, and in the Village of Freeville $89,430. For comparison, prices in the Towns of Ithaca and Lansing were $132,000, the Town of Groton $79,700, and the Village of Cayuga Heights topped the list at $180,000. Minutes for the January 15 Town Board meeting are now now available, including vague details of resolutions passed at the executive session. I can only find one 'no' vote in the whole thing. It's a very different style from my coverage, but it's certainly more detailed. If you want more detail on the Section 284 Highway Funds agreement, it's available here. 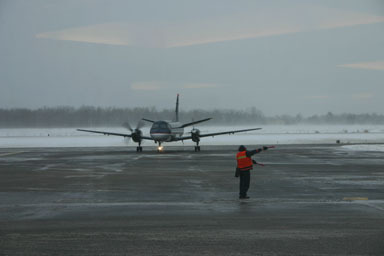 The Ithaca Journal is fairly quiet today on Dryden news. 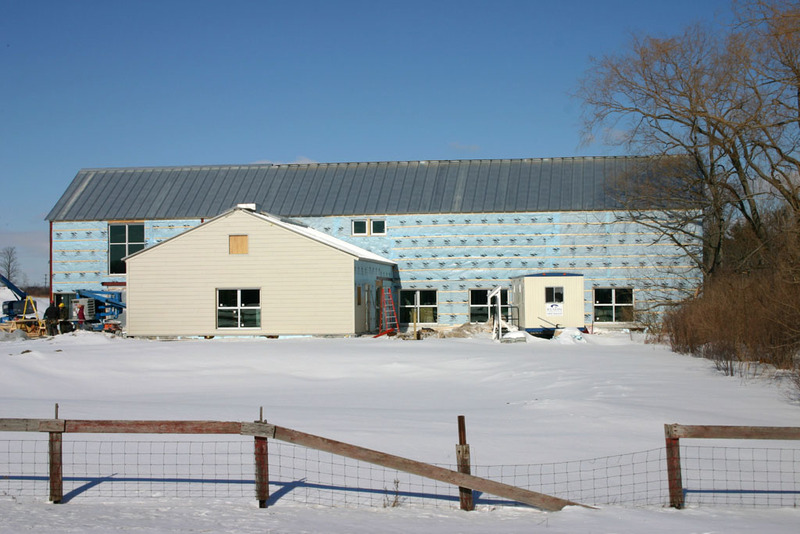 The largest item is a guest column from the SPCA director defending the SPCA (which is in Dryden and serves Dryden as well as the rest of Tompkins County) from an earlier letter questioning their practices. There's also a letter noting that the accidents this winter seem to be taking place on roads that have been widened and straightened, something I worried about last month. Finally, the Ithaca City School District is examining the impact of last year's staff reductions. Moving from The Antlers toward Varna, here are three more houses on Route 366. The Ithaca Journal has a follow-up story on the state auditing the Town of Dryden's books in response to accusations of forgery against a former town bookkeeper. They quote former supervisor Varvayanis, current supervisor Trumbull, and town attorney Mahlon Perkins. Apparently they're also collecting quotes from local firms for an audit, as the state is "short handed". There's been yet another accident on Route 13, again, like last week, near Gulf Hill Road. 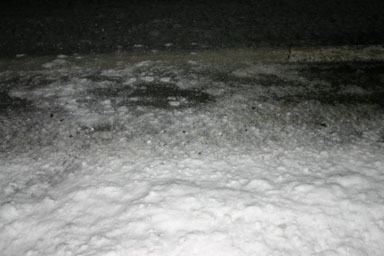 There's some dispute over whether blowing snow was involved in the accident. The Town site now has a list of February meetings (local copy). The main Town Board meeting is February 12th, 7pm at the Town Hall (map). I'll be out of town for that one, but this month I'll try the Planning Board meeting, on the 19th, 7:30pm, also at Town Hall. This week's Shopper includes a notice that Patricia Mooney is the new Clerk/Treasurer for the Village of Freeville. They also list village hall hours, which are Tuesday and Thursday 10am-3pm, Wednesday and Friday Noon-4pm, and Saturday 8am-Noon, closed Sunday and Monday. The weather this week hasn't been all bad, but it hasn't been all good either. The Ithaca Journal reports little action at last night's court appearance of Liva Brong, former Town of Dryden bookkeeper. Brong stands accused of forgery and grand larceny. Brong's attorney and the District Attorney's office are "still discussing the case and were not ready to weigh in on whether it should go before the grand jury," so the next step will be another hearing on March 4th. Dryden elementary school had a science fair for third- to fifth-graders yesterday,bringing science and a veterinerian to students from Dryden and Cassavant elementary schools. If you want to vote in New York's March 2nd presidential primary, today is the last day to register. 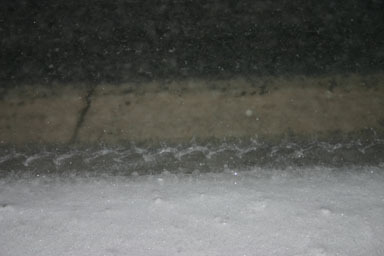 This morning's freezing rain falling on snow produced miniature models of white canyons. and a letter from Jim Mica questioning alternative medicine. Update: as noted in the comments, I missed one. Darts and Laurels also includes Tricia Edgecomb thanking the "unidentified parent who scraped snow off teachers' cars at Dryden Elementary School while she waited for school to end to pick up her child". The 1996 Virgil Creek flood leads a story on hazard mitigation in today's Ithaca Journal, examining how the county and the towns are working on plans to protect themselves from various kinds of disasters. The class, scheduled to run for two hours, will give the public a look at the assessment process, something that has gained attention in recent years, since the county starting reassessing property on an annual basis. They also mention that the Assessment Department will be mailing assessment disclosure notices to Dryden residents February 27, with hearings on appeals scheduled from March 15 to April 3. 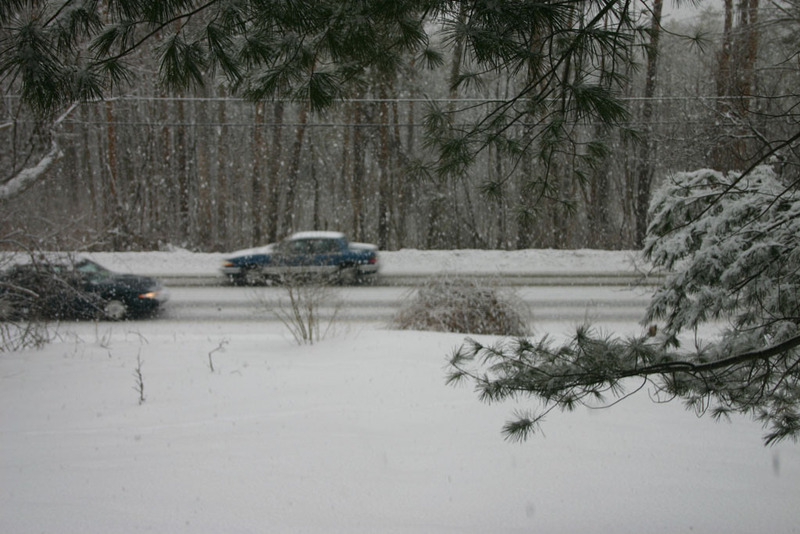 An article on yesterday's messy weather notes that "state police in Dryden stated Friday night that the slush and sleet caused a few cars to go off the road, but no major accidents were reported." Finally, it isn't Dryden-specific, but the Journal reports that the Tompkins County economy has a "strong base" for the future. The Varna Community Association (VCA) is hosting a pancake breakfast tomorrow from 8am to noon at the Varna Community Center (map). $6.00 gets you all the pancakes, bacon, eggs, and french toast you like. Yes, I was technically in Lansing when I took these, but they all have the Town of Dryden in the background. In the first picture, you can see snow blowing toward that slippery stretch of Route 13 by the airport fence. 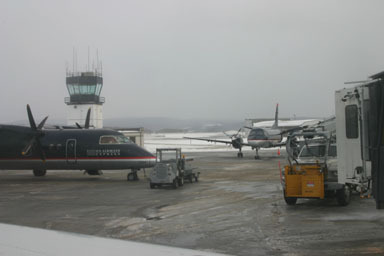 Finally, here's a picture of some planes, with Mount Pleasant in the background. We took off toward Cayuga Lake, so I didn't get a chance to take aerial photos of Dryden. The larger part of McLean being outside of our territory in the adjoining town of Groton, we include in this chapter what we can claim of it as a part of Dryden. In the year 1820 Samuel Mallory, then 22 years of age, walked from his native place in Sharon, Conn., to Homer, N.Y., and five or six years later he purchased the mill site and water power at the point on Fall Creek, about one mile from McLean, which, from him, was named Malloryville. Here he built a saw-mill and added carding and cloth dressing machinery as well as a dye-house, and finally established a chair factory, so that in these, their best days, the mills of Mr. Mallory gave employment to twenty-five or thirty men and one-third as many women in the different kinds of work. Some of the products of the chair factory are still in use today, indicating that the furniture of that time was much more substantial that most of that which we buy in these days. But in 1836 a great fire wiped out the flourishing industries of Mr. Mallory, and he was so discouraged that he sold out and removed to a location in Wisconsin. Some years later, about 1845, barrels were manufactured at Malloryville, by Wm. Trapp, who invented the first successful machinery for that kind of work. Still later the manufacture of tubs and firkins began to develop here under the firm of Howe & Watson, who later, in 1867, sold out to Rev. E. R. Wade, who conducted the business down to within a short time. Another fire in 1855 and still another in 1875 destroyed the manufacturing plant at Malloryville, but as often as it has been burned down it has been rebuilt, and in spite of the changes in the times the manufacturing industries at Malloryville still survive and have a promising future. The mercantile interests of Malloryville center at McLean, beyond our jurisdiction; but one hotel, the "Dryden House", of the management of which our town has not always had reason to be proud, the railroad depot, as well as the creamery of McLean, and one church, of the Roman Catholic denomination, come within our territory. The latter was erected in 1851 at a cost of one thousand dollars, the site and that of the Catholic cemetery near by having been donated by Michael O'Byrne. The society was formed in 1841 and among the first members were John Keenan, Patrick Corcoran, Matthew O'Byrne, James Walpole, Patrick Donnelly, Thomas and Patrick Kane. HOWE, SOLOMON L., who was born in Groton in the year 1824 and was educated at the old Groton Academy. Having relatives in Cattaraugus County he went there as a school teacher when he became of age and there married Miss Rispa Smith, of Yorkshire, in 1848. Returning to Tompkins county he settled at Malloryville in 1853, where he was employed by Howe & Watson, the senior member of the firm, Lemi Howe, being his cousin, in the manufacture of their wares on the contract system, making some practical improvements in the process of their manufacture. He was of a mechanical turn of mind and for many years, in addition to his other duties, was the principal surveyor and civil engineer of the township. Among his other work in this line was the survey for the Dryden village water works and the laying out of the E., C. & N. R. R. through the town. He was at least twice elected commissioner of highways of the town and served two terms as school commissioner of the second district of Tompkins county. His death occurred July 25, 1895. His three sons are civil engineers in the West, his only daughter being the wife of F. J. Per Lee, of Groton. Wherever his duties called him, Mr. Howe was always a faithful, upright man and an efficient officer. MALLORY, SAMUEL, who portrait is given at the beginning of this chapter, and after who Malloryville was named, was born in Sharon, Conn., April 18, 1798. He first married Nancy Hooper, of Homer, N.Y., who died in 1827. His second wife was Jane, daughter of Deacon Amos Hart, who, with four daughters, survives him. After leaving Malloryville he lived in McLean for a few years, but in 1844 moved to Elkhorn, Wis., where he engaged in hotel keeping in the early days of that country, serving two terms as treasurer of his county. He did in April, 1897, lacking only a few days of being 99 years of age. He was an exemplary man who in his long life made many friends, only a few of whom survive him. WADE, REV. EDWIN R., was one of the Century Committee of Dryden's Centennial, and died since the writing of this history was commenced. He was a clergyman of the Christian denomination and, in addition to his clerical duties, in the year 1867 he engaged in the manufacturing business at Malloryville, which he continued there until near his death. His shop had at one time a capacity of turning out sixty thousand tubs and firkins annually, a large amount of the raw material required being, in later years, imported from other states. The changes in the demand for butter packages within the past few years have almost wiped out this industry, which was so flourishing at one time at Malloryville. Elder Wade, as he was commonly called, came to Dryden from Cayuga county, where he had served as supervisor of the town of Niles, and in 1874 he was elected to the same office in our town. He was a man who united civil and religious virtues with a practical, honest, useful life. The writer has known him, at a funeral, to conduct the whole service alone, preaching, reading, praying, and finally singing the hymn without assistance or notes. He was everywhere recognized as a sincere Christian and an excellent citizen. Goodrich, George B. The Centennial History of the Town of Dryden, 1797-1897 . Dryden: Dryden Herald Steam Printing House, 1898. Reprinted 1993 by the Dryden Historical Society. Pages 149-152. Residents of the Dryden Central School District are invited to a meeting tonight with Dr. Vincent Coppola, the consultant on the district's search for a new superintendent. This is not a board meeting; it's strictly a meeting for residents to share their thoughts on the next superintendent. The meeting is at 7:30 tonight in the Middle School/High School library. 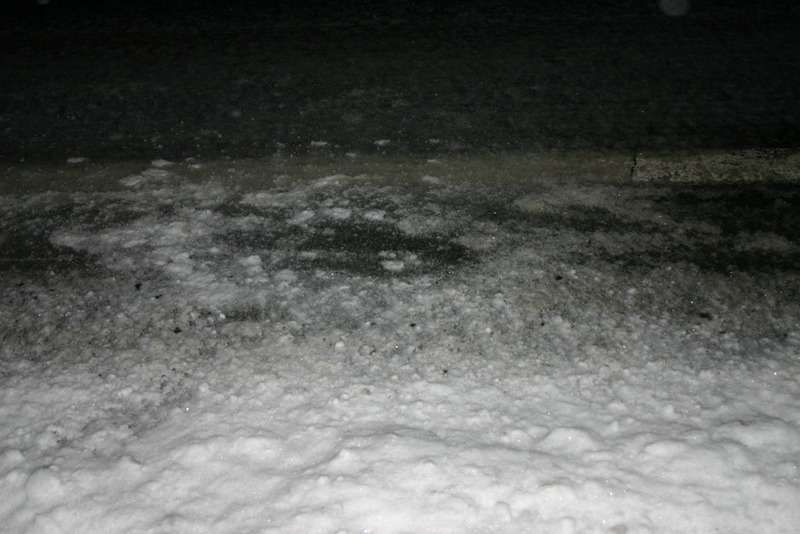 The Ithaca Journal reports that the outdoor ice rink has had some difficulties, largely because of uneven weather. "We had an unusually warm winter so ice was slow to form. Then we had some extreme cold weather but it was followed by a heavy snow, which acts like an insulator so you're not making ice," said Jeffrey Eller, a senior fish and wildlife technician with the Department of Environmental Conservation in Cortland. 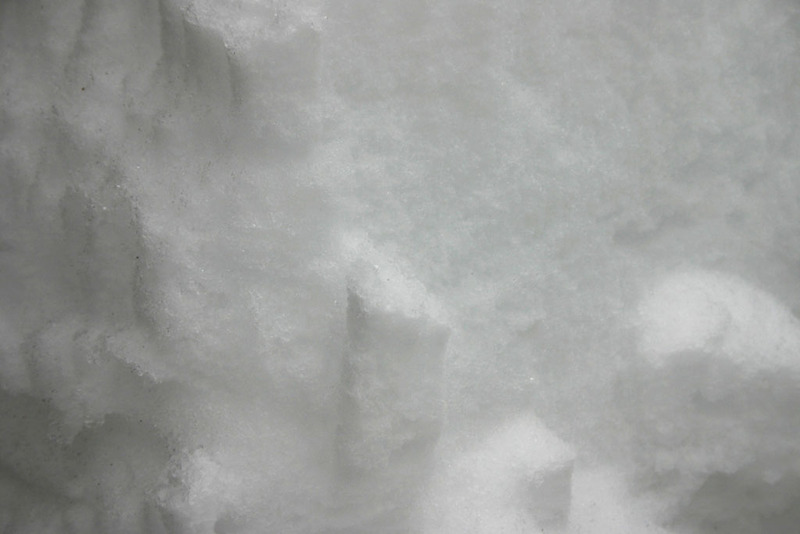 "It's not ideal conditions this year. Right now it's like a swamp out there." The fire company is willing to add more water if the weather looks promising, so this may work out yet. The Ithaca Journal reports on the first of three classes explaining the assessment process in Tompkins County. Future classes are at Lansing Town Hall (map) from 7-9pm on February 24, and at Ulysses Town Hall (map) from 7-9pm on March 8. The Ithaca Journal's "Alternative Tompkins" feature explores herbalist Suzanne Hoback's love potion workshop, held at the Foxglove Bed & Breakfast in Freeville. The Ithaca Journal reports on rising real estate prices in Tompkins County, driving assessments higher and making it harder for people to buy homes in the county. People are moving further out as a result, it seems. The Community Foundation of Tompkins County and the Tompkins County Chamber of Commerce will host a rountable discussion on housing issues tomorrow at the Clarion Conference Center (map). Registration starts at 7:30am. The agenda for tomorrow night's Town Board meeting has been posted. A public hearing on the Time-Warner Cable franchise, an update on the Freese Road sewer pump, annexation issues, fire company audits, a Conservation Board, 2004 Old Home Days, and lots more will be discussed. Dryden schools are getting out fifteen minutes early today as an "emergency go home drill". There's also a new Dryden Board Briefs posted (and in The Shopper). They don't seem to be archiving these, so I guess I'll try to collect them here. The Shopper also includes a notice for the next meeting of the Dryden Central School Board of Education, which wll be Monday the 23rd in the Middle School/High School library. The meeting proper starts at 7:15pm, but there is an update on state education financing issues at 6:30pm. Assessments are going up, but so are housing costs and apparently rents as well. The Ithaca Journal has both an article and an editorial on the subject. The median price of a home in Tompkins County is $119,500. As I noted earlier, the median price of a home in the Town of Dryden last year was $119,250, in line with the county, though the the Village of Dryden was $98,500 and the Village of Freeville $89,430. Even without heavy snow, we've had two more accidents on major roads in Dryden. One was a tractor-trailer rollover on Route 38 near the high school, while the other sounds like a rear-ending. and a dart from Lori Levine about the Superbowl halftime show. 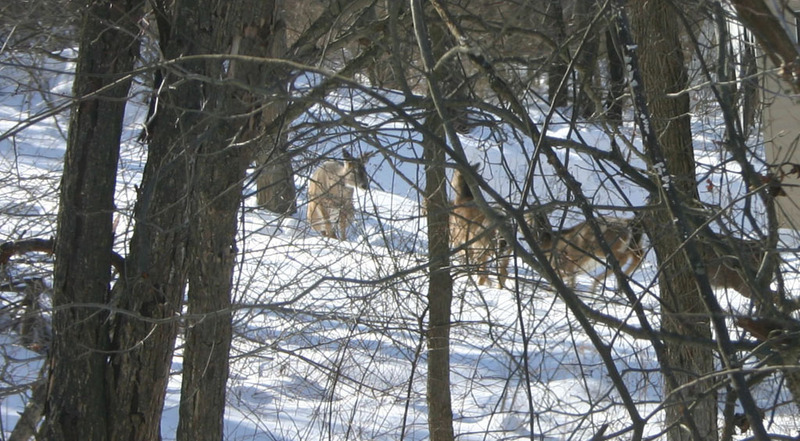 When I've seen deer this winter, they've been in herds. 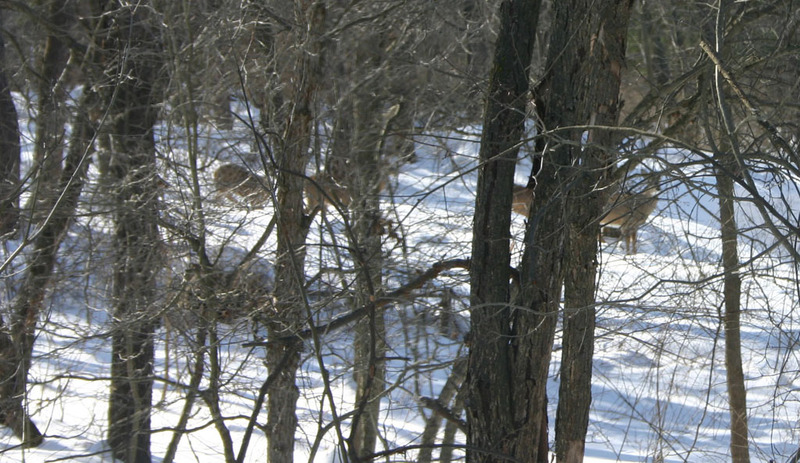 Five deer, ten deer, twenty. 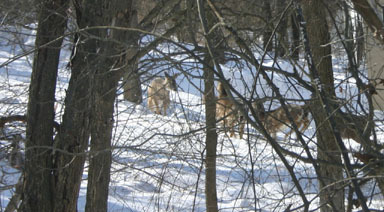 These are pictures of a group of about ten deer. The turkeys came in numbers too. The next few buildings going down 366 toward Varna are commercial, more business space than residential, though they aren't quite as distinctive from the surrounding houses as seems ordinary today. The Ithaca Journal features a picture of a female snowmobile rider on her way through the hills of Dryden and Caroline as a benefit for breast cancer. Fernando de Aragon, the Executive Director of the Ithaca-Tompkins County Transportation Council, will be speaking at the Varna Community Center (map) next Tuesday, February 24, at 7:30pm. "Speed humps, neckdowns, diverters, bumpouts, and a host of other traffic calming features may find applicability on city streets, but what would rural traffic calming look like? With a state Department of Transportation strongly resistant to lowering the prevailing state speed limit of 55 mph, even on neighborhood streets, speed limit enforcement is not the answer. All are invited to a discussion focused on speed, safety, emergency access, road design, community character and rural traffic calming." 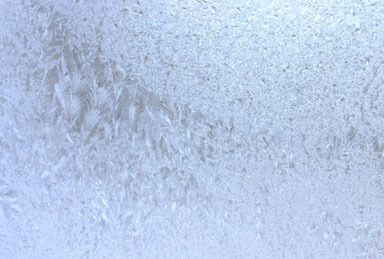 Aragon presented similar material in West Danby last month. That was largely a conversation rather than a presentation, and I'm looking forward to seeing how local Dryden issues affect the discussion. In West Danby, Route 34/96 dominated the discussion; here we have Routes 13 and 366, plus lots of smaller roads with their own traffic issues. 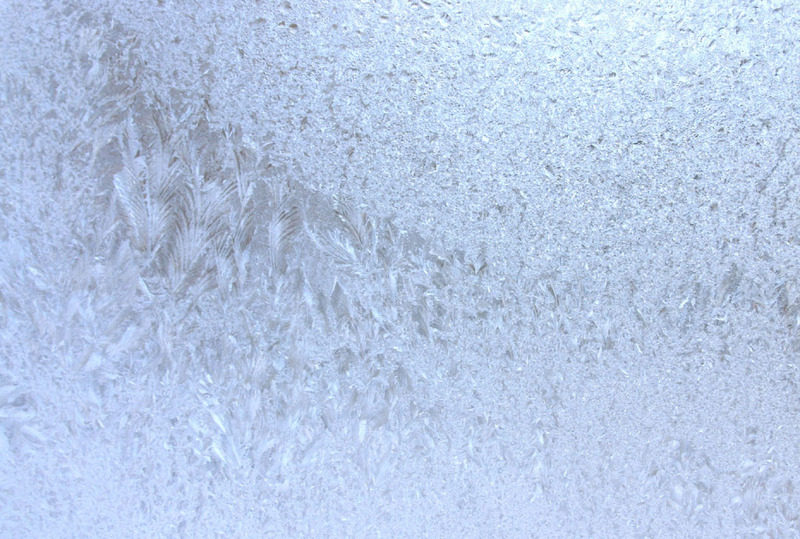 It's much warmer now, but there was some amazing frost this morning when it was -5. In yesterday's Dryden Town Talk, Cathy Wakeman visited the Bethel Grove Church for a meeting of the Community Faith Partnership, discussing "Recovery, Redemption and the Christian Community." Haschmann added a fifth item as necessary for recovery: a community that is willing to support and hold accountable the recovering addict. He expressed appreciation for those in the faith community who are helping to make the treatment centers successful by their direct support. Today's Ithaca Journal includes more than you likely want to know about water, sewage, restaurant, and other violations in Tompkins County, including Dryden. The minutes for the January 27th meeting the Dryden Town Board had with the fire companies are now available. I covered this a few weeks ago, but the minutes have a much more detailed reporting of the flow of conversation. The Ithaca Journal reports that the Jim Schug Trail from Dryden Lake to the Village of Dryden has been groomed for cross-country skiing. The Dryden Caroline Drifters Snowmobile Club has volunteered to groom it weekly during the winter. This morning's Ithaca Journal reports that two of Dryden's three county legislators voted to "protect the transgendered community and others from discrimination in employment, education, credit, public accommodation and housing." The county legislature split by party, with eleven Democrats, including Martha Robertson and Michael Lane, supporting the measure and four Republicans, including George Totman, opposing it. 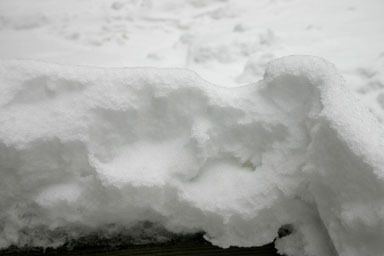 The Journal quotes Dryden residents as pleased by the relief it will give them. Planner George Frantz (who is, among other things, the consultant working on the Town of Dryden Comprehensive Plan) has a strange but certainly thought-provoking guest column in the Ithaca Journal today. While it purports to be about a specific traffic proposal in Ithaca, much of its venom is directed at places like the Town of Dryden and their impact on Ithaca. He starts by attacking the "lame rhetoric" of people who charged that fixing Ithaca's notorious 13A/79/89/96 Octopus intersection would cause environmentally-unfriendly growth, and charges that "reality-based local transportation decision making" is a casualty of such claims. In 1970 the City of Ithaca was home to 27 percent of Tompkins County families. Today the city is home to a mere 15 percent of county families. Sprawl reigns here in Enlightened City, USA, and with sprawl so reigns the automobile. Little wonder, as here in Ithaca it's still politically correct to carve a house lot out of the forest or farm fields far out beyond the Town of Ithaca and needlessly consume 300, 400, 500 or more gallons of gasoline per year commuting between paradise and the city. Dryden is certainly part of the trend, politically correct or not, that Frantz sees as a problem. I watch the commuters come and go from a house that was plainly built (in 1929) once the automobile made commuting the few miles to Ithaca convenient. (The garage is tiny, but it is built into the house.) Moving Route 13 from present 79/366 shifted the immediate burden of sprawl to Lansing's Triphammer Road area, but much of Dryden is bedroom community for Ithaca, and some of it is in fact deep in the woods or the fields. While the Draft Comprehensive Plan seeks to limit some of that impact by limiting densities in much of the town, that still leaves lots of houses and potential houses to be precisely the gasoline-wasting isolated paradises to which Frantz objects. The plan's objective to "Recognize Ithaca, Cortland and areas adjoining those cities as the centers of regional commercial activity," virtually ensures that Dryden will be the home of cars that regularly drive through Ithaca for a long time to come. Instead of looking at traffic sources, though, Frantz turns his fury on people who question the need for yet another road through Ithaca. Without this road, he asks, "how attractive is a gridlocked West End going to be to the investors that the city is now currently trying to attract into the area?" Ithaca and Tompkins County more generally might well benefit from more coordinated planning, especially given how the county's topography forces such a tremendous share of traffic through downtown Ithaca. (I joke about a Lansing-to-Trumansburg suspension bridge, but it seems unlikely at best, as does a bypass from Newfield to Dryden.) Complaining about the people who live in the Ithaca area and their predilections for Volvos and Subarus (I drive a Saturn!) doesn't seem likely to produce much change of the kind Frantz seems to want. 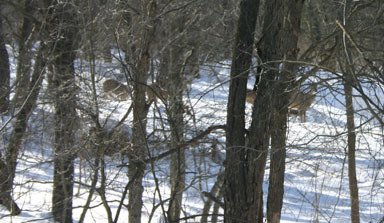 I stopped by the Reynolds Game Farm (map) Monday and took some pictures of the residents and some visitors. The Planning Board will be discussing revisions to the Draft Comprehensive Plan over the next several meetings. Public comments have been summarized into the topic areas listed below. This list is not in order of priority - all public comments will be considered carefully. The Planning Board also recognizes that many of these topics are interrelated. However, this list will help to guide the revision process over the next few months. The Planning Board will focus on the first two topics at the upcoming February 19th meeting, with hopes of also addressing the third and fourth if time permits. The public is welcome to attend. For each subsequent meeting, the Planning Board will post the topics to be discussed in advance of the meeting. We apologize that this first posting gives such short notice. The planning board continues to welcome all public comments in writing regarding the Draft Comprehensive Plan. If you have any interest in Etna or Varna, it looks like Thursday night, 7:30pm, the Dryden Town Hall (map) is the place to be. While the Town of Dryden Planning Board takes up revisions to the Draft Comprehensive Plan for hamlets tonight, the Ithaca Journal reports that the Village of Dryden will have a public hearing on maintaining their housing construction moratorium while discussing a call for proposals on their own Comprehensive Plan. The Village recently received a $15,000 state grant for planning, and is working on a consolidated housing plan as well. Absentee ballots are available for March 16 village elections. There's also an article on sledding in Tompkins County, including Dryden, and a letter from Village of Dryden resident Maureen Brull on the pace of death penalty proceedings. Also, an article on the increase in homelessness in Tompkins County brings out a different angle of rising housing costs. The road used to be small, and peaceful. It's neither today. There's also a comment in the history that "the proximity of Varna to Ithaca has always interfered with its prosperity as a business center," which is still true. 1. Geo. E. Underwood. 21. Wagon Shop. 2. Ezra Ostrander. 22. School House, No. 18. 3. Ezra Ostrander. 23. Marenus Crutts. 4. Mrs. Cooper. 24. W. C. Ellis. 5. Wm. J. Manning. 25. J. Pierce. 6. Wilson Baker. 26. Mrs. S. Grover. 7. Frank Powers. 27. O. T. Ellis. 8. Philip S. Snyder. 28. Seaman & Snyder. 9. Mrs. Olive Crutts. 29. M. E. Church. 10. Grist Mill. 30. M.E. Parsonage. 11. Wagon Shop. 31. Wm. J. Manning. 12. Marenus Crutts. 32. Geo Brown. 13. Marenus Crutts. 33. Mrs. Isaac Creamer. 14. Geo. Underwood. 34. Mrs. Sherwood. 15. Robert Smiley, Postoffice. 35. Frank Ellis. 16. Ernest Snyder. 36. J.T. Morris. 17. Milo Williams. 37. Will Ross. 18. H. Brink, Store. 38. Frank Hazen. 19. J. Whipple. 39. Depot. The annals of the early settlement of Varna seem to be hopelessly lost. We cannot even obtain a hint as to the origin of the application of its name to this locality, the only Varna of which we have any knowledge being a Bulgarian city of that name on the shore of the Black Sea. It, however, had an early history, and among its first settlers were men by the name of Dyer, Jarvis and Blue, followed by Ebenezer Brown, Erasmus T. Brown, Jonathan Knowles, James Bird, Gen. John Munson, Peter Talmadge, John Ewers, Dr. Call, James McElheny, Wm. H. Miller, Walter Dowe, Dr. Ide, Dr. Pomeroy, William Cobb, William Schutt and Issac Creamer. Both the first saw-mill and the first grist-mill are said to have been built by Gabriel Cain, in 1803, the former near the site of the Hart mill, where Amos Ogden, in later years, first instituted the custom of putting up flour in cotton sacks, for which paper has been substituted. The first tavern seems to have been built by a man by the name of Abner Chapin, near the site of the present hotel, in 1806, but the present hotel building was built by James McElheny in 1832, the first school house having been erected two years before on the opposite side of the street. On the site of the Crutts grist-mill there was constructed a saw-mill in 1818 by Gen. John Munson, and a sash factory was built in 1837 by Erasmus Brown, which was later occupied by Israel Brown as a distillery. Gen. Munson had a store in 1831 on the site now occupied by the Whipple blacksmith shop, the first blacksmith shop of which we have any record having been built by William Van Sickle in 1830. A tannery was built and operated by Z. Hartsough in 1840, followed by the building of the M. E. church in 1842 and the Presbyterian church in 1843. The proximity of Varna to Ithaca has always interfered with its prosperity as a business center, but there was a time, near the middle of our Century Period, when it had quite a business of its own. In those days it was a great horse market, and many a drove of horses was started from there to New York in the old-fashioned way, some twenty-five horses more or less being attached with yokes to long rope at the head of which was a leader on horseback, and a man with a cart or wagon attached to the other end of the line brought up the rear, while horses in pairs were attached to the rope all the way between. Such a troops of horse starting for the New York market in this way would be a novel sight in these days of rapid transportation. Large droves of sheep and cattle driven along the highways of our town enroute for New York were a frequent sight fifty years ago, on all of our principal thoroughfares. Not only was Varna in early times a great place for sending horses off to the cities, but it was noted as a home market where horses were sold and exchanged in great numbers, and where the running of horses as a test of speed was a common practice before the present custom of trotting horses came in vogue. At one time there were some parties there by the name of Sloan Bros. who for years made it their headquarters for peddling clocks of Eastern manufacture throughout the surrounding country. The first M. E. church of Varna was organized at the school-house January 5, 1842, with the following as trustees: Hoffman Steenburg, William Cobb, Robert C. Hunt, Benjamin Davenport, George Emmons, John Munson and Isaac Seaman. Their church edifice was completed the next year at an original expense of fifteen hundred dollars, extensive repairs having since been made. The pastors of this church have been W. H. Miller, A. H. Hamilton, D. Lamkin, L. G. Weaver, J. W. Steele, Elias Hoxsie, David Davis, G. W. Smith, A. Ensign, Sylvester Minier, L. R. Grant, E. House, D. W. Sherman, L.T. Hawkins, E. A. Peck, R. L. Stilwell, N. M. Wheeler, F. M. Wheeler, W. M. Fisher, P. W. Mynard, E. D. Thurston, G. W. Reynolds, J. L. King, C. J. Pendleton, M. J. Owen, P. H. Reigal, J. E. Showers, F. H. Dickerson. The Presbyterian Church of Varna was discontinued over thirty years ago and their building was taken down and removed to Brookton. It is not a little remarkable that a town which forms a part of the great watershed separating the St.Lawrence from the Chespeake systems of water courses - the streams of Dryden being represented in each - should possess such valuable water power privileges as are afforded by Fall Creek and its tributaries. Rising in the town of Summerhill and flowing south through the eastern part of Groton, Fall Creek enters Dryden near McLean and flows diagonally through our town in such a way as to afford an abundance of mill sites for water power. It is the central drainage artery of the township, receiving as tributaries Beaver, Mud and Virgil creeks on the south, and the West Dryden stream from the north, as well as other smaller additions. Although Fall Creek suffers considerable diminuition in times of drouth, especially since the country through which it flows has been mostly deprived of the shade of the forests, it still has good lasting qualities even in the dry seasons of summer and autumn. The largest and most consistent of these water powers, are, of course, situated on the lower part of the stream, the last one in the town of Dryden running the present Crutts mill, which still does considerable business in flour and feed grinding. Peter Talmadge also had a mill near by but on the north side. Next above is the Hart mill, already spoken of, and next above in the order being the Wm. Allen site, the Wm. Bishop or Sherwood Mills, the George Robertson site, later sold to Jonathan Card and Ward Mallory, who there manufactured chairs which are still in use, the Salmon Sharp site, the Rhodes site and the Wadsworth site, which brings us up to the Bartholomew mills in the vicinity of Etna. All of these water powers were first employed in sawing the pine lumber, which was very abundant in and about Varna, the pine trees along the northerly side of Fall Creek being the largest to be found in this region, often five feet in diameter and each cutting twenty-five thousand clear shingles or five thousand feet of first class white pine lumber. If any one of our readers is inclined to doubt this statement or consider it exaggerated, we can call attention to the fact as corroborating our accuracy that an occasional pine stump in the fence of this neighborhood is still shown which, split in two in the middle, makes four rods in length of stump fence. Of the pioneer families of Varna we can only speak of James McElheny, whose father, Thomas McElheny, came from New Jersey early in the century, first locating near Malloryville, where James married Betsy, a daughter of Judge Ellis. He was a justice of the peace of the town in 1830 at Ellis Hollow, afterwards a hotel keeper at Varna, and died in 1836 at the early age of thirty-five years. His father and the rest of the family had already removed to Allegany county, the children of James who remained here including John E. McElheny, of Dryden, and Thomas J. McElheny, of Ithaca. Isaac Creamer, although not strictly speaking a pioneer, came to Varna with the clock peddlers whom he assisted, about 1835, and for a long time he remained a prominent character in that section of the town. Although a pronounced Democrat he served as justice of the peace and justice of sessions in 1864, and was a leader among the Democratic politicians of the county. Esquire Wm. 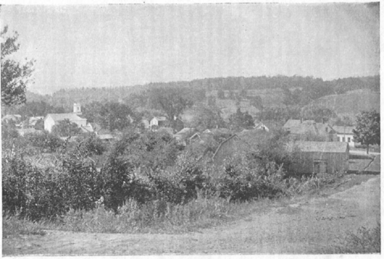 H. Miller, who was a justice of the peace of the town in 1833, came to Varna from Rensselaer county about seventy-five years afo, followed later by his father, Moses Miller; his sister, Mrs. Nancy Grant, now over ninety years of age and residing with her daughter, Mrs. C. D. Bouton, of Ithaca; and other sisters, Mrs. Samuel Rowland, afterwards residing at Willow Glen, where she died; Mrs. Angeline Brown, widow of Capt. Brown, now of Cortland; and Mrs. Charles LaBarr, now of Dryden village. Peter Talmadge seems to have been a prominent figure in the early times of Varna, his stentorian voice being employed to advantage in driving his oxen and being heard throughout the whole settlement. Although illiterate and unpolished in his speech and manners, Father Talmadge, as he was called, possessed rugged virtues, and when others of his less independent Varna neighbors bashfully admitted to the out-of-town merchants with whom they traded, that they lived "just in the edge of Dryden," it is said that he patriotically affirmed in unmistakable terms that he was not ashamed to own that he resided "in the very bowels of Dryden." Goodrich, George B. 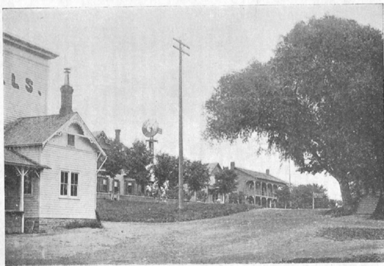 The Centennial History of the Town of Dryden, 1797-1897 . Dryden: Dryden Herald Steam Printing House, 1898. Reprinted 1993 by the Dryden Historical Society. Pages 130-5. We'll see what the Town Planning Board has to say about Etna's future tonight, but here's a rich description of its past from George Goodrich. Etna was a very busy place, and this entry is considerably longer than the one for Varna, and also has two pictures in addition to the map. 1. Mrs. C. Turner. 38. Blacksmith Shop. 2. J. T. Primrose. 39. Houtz's Etna Roller Mills. 3. E. F. Weaver. 40. Store. 4. James Rawley. 41. Ai Van Horn. 5. Geo.Cowdrey. 42. Ann Merchant. 6. L. Dusenberry. 43. Geo. L. Snyder. 7. Arthur Burr. 44. Mrs. William Haskins. 8. Mrs. H. Ralph. 45. Ladrew Sherwood. 9. Mrs. D. Weaver. 46. Eli Conklin. 10. L. Freeman. 47. Wm. Tichenor. 11. Wm. Smith. 48. Store. 12. School House, No. 11. 49. Arthur Coggswell. 13. Shoe Shop. 50. Meat Market. 14. David Brotherton. 51. H. A. Root, Hotel. 15. Dr. G. L. Rood. 52. Geo H. Houtz. 16. Baptist Church. 53. Mrs. C. Houtz. 17. M.E. Church. 54. Geo. H. Houtz. 18. Wm. W. Sherwood. 55. W. Marsh. 19. Mrs. J. S. Weidman. 56. Etna Hotel, C. Westervelt. 20. Dr. J. Beach. 57. Depot, L. V. R. R.
21. Edward Gaston. 58. Mrs. Mary H. Bartholomew. 22. E. Snyder. 59. T. Rhodes. 23. C. Bartholomew. 60. Freeman Bros.
24. Mrs. Davenport. 61. J. Bartholomew. 25. E. Freeman. 62. S. Ralph Estate. 26. L. Hemmingway, shop. 63. Milo Snyder. 27. L. Hemmingway. 64. Emma Snyder. 28. D. B. Conklin. 65. Mrs. Hurley. 29. Mrs. John Reed. 66. 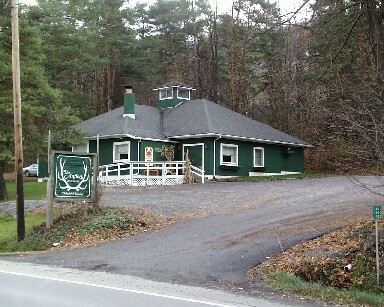 Etna Creamery. 30. Barbara Rulison. 67. Blacksmith Shop. 31. Arthur Burr. 68. Machine Shop. 32. P. Brady. 69. Hannah Lee Estate. 34. D. Brotherton. 71. Geo. H. Houtz, Store. 35. Cabinet Shop. 72. Mary H. Bartholomew. 36. Wagon Shop. 73. Mrs. G. B. Davis. We are not able to give the year when Rev. Wm. Miller and his brother Arthur, who was a blacksmith, commenced building in the wilderness of what is now known as the village of Etna, but was first called, after them, Miller's Settlement. The first grist-mill there was on the same spot and in the same building lately occupied by Jesse Bartholomew as a planing mill. The date of the erection of this mill cannot now be accurately given, and it has been claimed that it ante-dated White's mill at Freeville, but so far as we can learn, without authority, and, as it seems to us, without reason, for Capt. Robertson would not have gone to mill at Ludlowville with his crops of 1799 and 1800 if there had been a mill so near to him as Etna. The first date of Etna which we can give with any accuracy or certainty is that of the organization of the first religious society in the township, the first and we believe to this day, the only regular Baptist church of Dryden, which was organized February 29, 1804, at the home of William Miller. The meeting was opened with singing and prayer by Mr. Miller, Samuel Hemmingway being elected deacon, and John Wickham the clerk of the society. Among the original members are said to have been Francis Miller, Elijah Dimmick, Silas Brown, Ebenezer Brown, Nathaniel Luther, Job Carr, Ziba Randall, Timothy Owens, Jonathan Dunham, Joshua Jay, Abraham Woodcock, Nathan Dunham, Joel Whipple, Samuel Skillinger, Morris Bailey, Orpha Luther, Asher Wickham, Mehitable Carr, Betsey Brown, Abigail Dimmick, Mary Owens, Lucy Dunham and Katie Woodcock. A saw-mill was built at about the same time as the grist-mill, upon the site lately occupied by the Houtz saw-mill, and afterwards a fulling mill owned by Joseph Newell and Stephen Bradley, on the ground now occupied by the blacksmith shop of Bert Conklin. Daniel Carr and John McArthur carried on the first store in the house formerly occupied by Wm. Miller and now owned by the Houtz family. 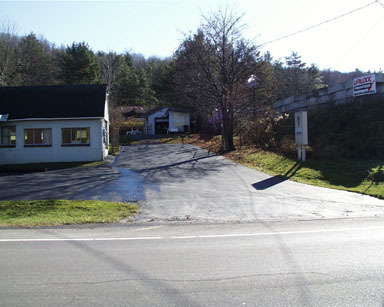 The first blacksmith shop stood where is now the center of the road between Houtz's store and grist-mill. 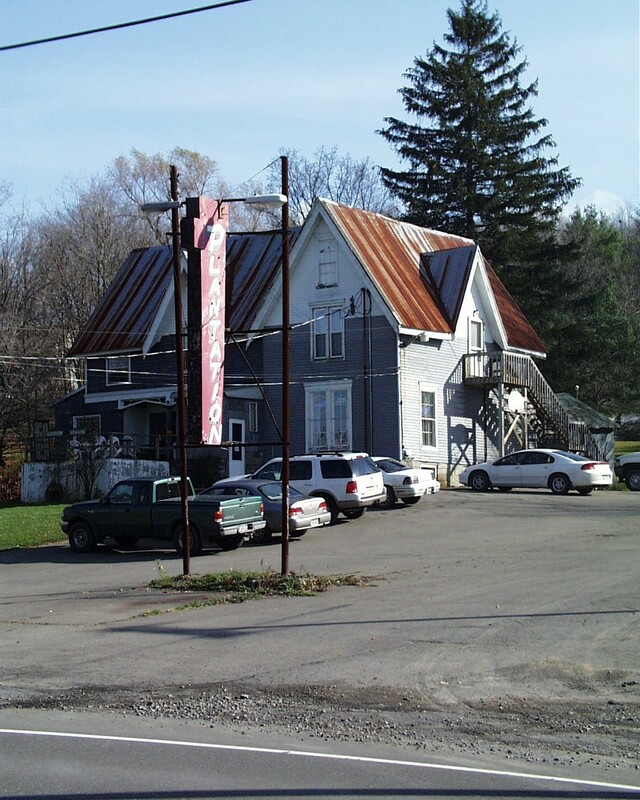 The first church building was of logs on the lands of Nathaniel Luther, but was replaced by a frame building on the same ground, which is where the Etna Creamery Co.'s building now stands, and the building is the same one which Caleb Bartholomew used as a pattern shop. At that time there was a bridge across Fall Creek at that point. The first school house stood on the site now occupied by the Houtz store and was the building afterwards used as the old cooper shop, which was finally taken away by high water a number of years ago. About the year 1815 the place took quite a change. Wm. Miller sold out his property to the Houtz family and the new settlement from that time bore the name of Columbia until about the year 1820, when the postoffice was established under the name of Etna. In the meantime Bradley & Newell sold their fulling-mill to Rice Weed. Stephen Bradley owned and occupied the place now owned by Hiram Root, which afterwards became the property of Joseph Hemmingway. Here he built the hotel, and the original "Bradley House" of former years is a part of the present hotel. The first shoemaker was Jacob Lumbard, whose descendants are known in the town of Dryden. About the year 1818 a store was built on the ground where Ed Carbury now lives, just east of Root's Hotel. At the same time there was another store kept by H. B. Weaver in the building now known as Houtz' white shop. Henry Beach built a sawmill which was burned on the island about where is now the center of the Houtz dam. Beach sold his interest in this property to J. H. Houtz, who rebuilt the mill, but later took it down to make room for a distillery. On that particular spot one saw-mill and two distilleries were burned and the last distillery was taken off by high water a few years ago, being remembered by the present generation as the old sash factory. Another distillery stood on the island just back of Conklin's shop and was owned by John Dodge who came from Maine. 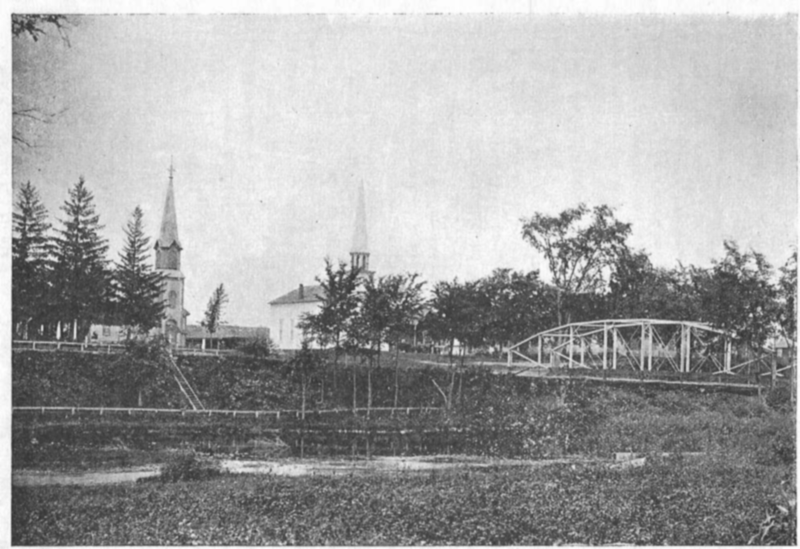 Columbia had two bridges at that time, one of which has been mentioned, and the other extended across the creek nearly in front of where Dr. Rood now lives. 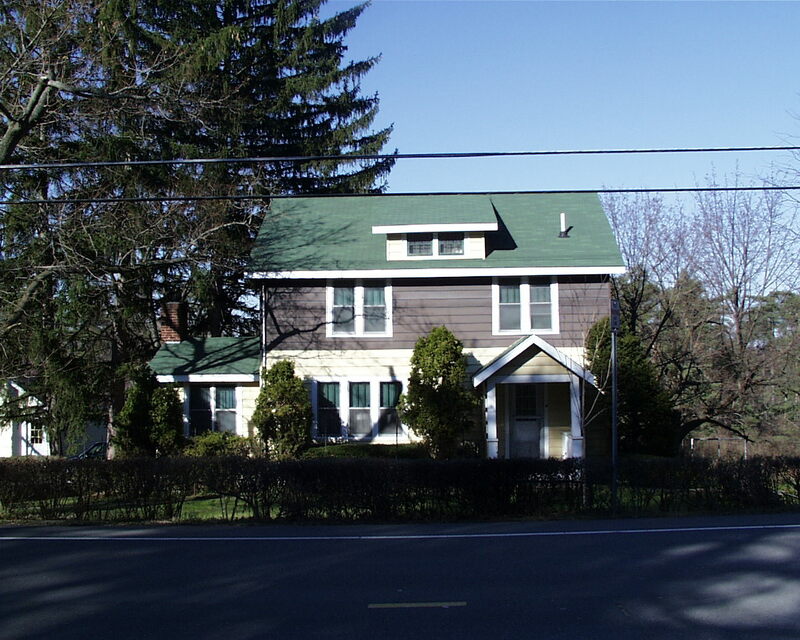 When Henry L. Beach sold his property to J. H. Houtz he moved to what was known as Lower Etna, where Truman Rhodes now lives in a house that was then built by Mr. Beach as a hotel, from which there was a road running south to the corner of the pine woods. 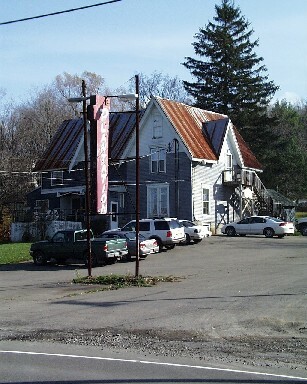 At that time Lower Etna possessed a hotel, paper mill, blacksmith shop, store, wagon shop, and several other buildings. The first tailor was John Weaver, who had a little family of children from which only nine attended school at one time. 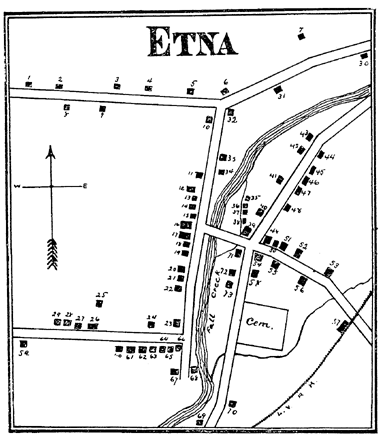 The First M. E. church of Etna was organized April 13, 1835, and their meetings were held in the village school house until 1837, when the present church edifice were erected at a cost of about two thousand dollars, seating two hundred persons. The first trustees were James Freeman, Alvah Carr, Michael Vanderhoef, Richard Bryant, Thomas J. Watkins, Oliver Baker and John H. Porter. Fifty years ago Etna had a hard name, being then noted for its horse running and liquor distilling proclivities, there being no less than ten or twelve stills within two miles square of this section of the town. While the general business of the place has not increased in recent years the character of its inhabitants and industries has very much improved, and a stranger who now visits Etna finds it very pleasantly located upon the opposite banks of Fall Creek, which are here connected by a very substantial iron bridge, one of the largest and best in the township, and the dwellings and public buildings, including churches and schools, show abundant evidence of the thrift, good taste, and enterprise of the inhabitants. The butter factory, recently incorporated, is one of the manufacturing enterprises which flourish, and for the past twenty-five years Etna has not been behind her neighboring villages in mercantile enterprise or in the educational advantages furnished by her excellent school. Bartholomew, Jesse, Sr., was born in Branford, Conn., in 1763, and about 1783, in Lee, Mass., married Mamra Bradley, who did in Dryden in July, 1823, after which he married Betsey Locke Updike in Dryden in 1831. He came in 1798 to Herkimer county, from which place, after living in Locke, Cayuga county, he moved to the town of Dryden in 1812 or 1813, and purchased and settled on the land now known as the Hanford farm, one-half mile east of Etna, from which he was subsequently driven off by a man who claimed a better title. While he yet lived on the corner where the Etna road joins the Bridle Road, and in the traditional cold season of 1816, he raised a field of corn, said to have been the only crop of that kind matured in the town of Dryden that year. He died in 1846 aged 83 years. He was a devoted Baptist and is said by his children to have been so even-tempered as never to have been seen in a passion. He was the father of fifteen children and the grandfather of over seventy. Among the former were Jesse Bradley, who carried on a distillery in Dryden village in the Pioneer Period and moved to Michigan, where he died leaving a large family; Lemi, who served in the War of 1812, having enlisted as the record says at Dryden, Cayuga county, N. Y., in August, 1814, in Col. Fleming's regiment, which rendezvoused at Cayuga Bridge, and was one of the volunteers who took part in the celebrated "sortie of Fort Erie." He died in Westfield, N. Y. in 1872. Daniel, Sr., was born in Locke in 1798, and in 1819 married Jerusha Griswold, whose children, Mary (Wheeler) and Daniel, Jr., are still well-known residents of Dryden. Caleb and Jesse, Jr. have for many years been prominent business men of Etna, where they both still reside, Caleb having been largely engaged in the manufacture and sale of scales and iron bridges, while Jesse has manufactured specialties, one of which was the first machine used in Etna which would do planing and matching of lumber at the same time. Carr, John, is said to have come to Etna from Pennsylvania as early as 1800, settling in the western part with his three sons, Job, Peleg and Caleb. His wife is said used to call her sons in the morning, saying: "Come, boys, the birds are saying Job, Peleg and Caleb." Dunham, Jonathan, with his three sons, Henry, Louis and Nathan, coming from Pennsylvania, settled near Etna about the year 1800. McArthur, Rev. Daniel, from Scotland, arrived in New York May 29, 1811. He was originally a Presbyterian, but changed his religious views and went to Edinburgh, where he was baptised and united with the Baptist creed. Soon after he took passage for America in the hope that the change of climate would prove beneficial to his wife, who was in poor health but died upon the voyage and was buried on Staten Island. After spending some time with friends in America from his native land he met Mr. Quigg, of Ithaca, on the Hudson river and was influenced by him to come to Dryden, as he did, and died here in 1847, leaving many descendants. Houtz, Rev. Anthony, with his father, Philip Peter, migrated from Germany in 1768, when the former was only ten years of age, locating at Lancaster, Pa., where the son learned the trade of a tailor, and using this occupation as a means of support he studied theology and was licensed to preach by the German Reformed Church. The original family name was "Hauz"; but as they soon began to speak English, they changed the spelling and pronunciation to Hautz and later to Houtz, which with the English spelling is the exact German pronunciation of "Hauz". During his pastorate in Pennsylvania, his first wife died and in 1803 he married Katrina Keller, who became the step-mother of his four children and in the year following the mother of his fifth, John Heinrich Hauz, who was the old merchant and miller, John H. Houtz, so well known to the old residents of Etna, where now lives and toils at the roller mills his son, Col. George H. Houtz, the great-grandson of Philip Peter Hauz. In the years 1804 and 1805 Rev. Anthony Houtz preached at Canoga and Lansingville and as early as 1806 located at Etna, where he served the people not only as their preacher but also as a tailor, jeweler, or "time keeper," as they were called in those days, and as druggist and physician. His books, still preserved, show that the most universal diseases of the section at the time were the usual new country plagues, the ague and the itch. He was a very useful and much respected man in the new settlement, where he died in 1813 and was buried in the Etna cemetery. 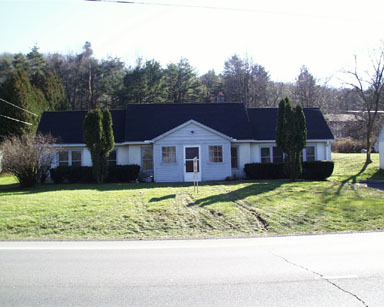 The Rhodes family of the town of Dryden are of English descent, their ancestors having originally settled in Pennsylvania before the Revolutionary War and their great-great-great-grandfather was a cooper by trade who worked for Washington's Army and was killed by Indians in the massacre of Wyoming. One of his sons, George Rhodes, came to Lansing from Northumberland county, Pa., in 1792, coming by the way of the Susquehanna river to Owego, from there to Ithaca through a forest road, and from there to Lansing, where they settled. They cut their way through the original forest, going east from Ithaca to a spot just east of Forest Home, where they crossed the creek and from there went north to the farm now occupied by John Conklin. Of a numerous family, one son, Jacob Rhodes, left home in 1804, when he was twenty-one years old, to go for himself. Taking his rifle, ammunition and hatchet, he came to the present town of Dryden, sleeping the first night on the banks of a small stream a short distance southwest of the present site of the village of Etna. From there he went east to where Freeville, McLean, and Dryden now are, camping the second night near the forks of the creek near Freeville. After prospecting for a number of days he came back to where he camped the first night and located, buying a claim owned by a revolutionary soldier named Savage, from Rutland, Vt. His early life was the usual one of the early settlers. For years he kept house by himself and depended upon the forest and streams for provision. He was noted for his woodcraft and marksmanship. In fact, he was barred from taking part in shooting matches, for, with him, to shoot was to win, and at the present time spots can be pointed out where he killed deer, bear, etc. He married Margaret, daughter of Christopher Snyder, and of a family of eigh, four sons great to an old age, the four daughters having died in childhood or youth. The sons were Wm. S., Geo. W., and Miles and Truman Rhodes. The old home of Jacob Rhodes was until recently owned by Miles Rhodes, and is now occupied by W. J. Davis. Jacob Rhodes, by combining farming with a distillery, accumulated a large property, which is now owned by his grand-children, consisting of about one thousand acres of land, lying in nearly a solid body south and west of Etna. Goodrich, George B. The Centennial History of the Town of Dryden, 1797-1897 . Dryden: Dryden Herald Steam Printing House, 1898. Reprinted 1993 by the Dryden Historical Society. Pages 136-44. The Ithaca Journal reports that a fire caused by a fireplace at 10 Freese Road destroyed a mobile home. No one was injured, and two dogs were rescued. 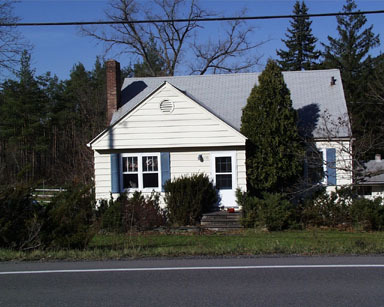 Tompkins County will consider ending annual assessment, after a number of years in which real estate prices and assessments have increased substantially. State aid supporting annual assessments may not come this year, and property-owners have been unhappy. On the other hand, as Legislator Kathy Luz-Herrera points out, if prices were to fall again, people could be stuck with inflated assessments for a while to come. The Journal's editorial continues with the theme of housing costs, examining yesterday's story on homelessness and also looking at ways municipalities can support affordable housing through zoning and other mechanisms. Last night's meeting for "discussing revisions to the Draft Comprehensive Plan" wasn't precisely a Planning Board meeting, as only two members of the board were there (four are necessary for action), and only six people were in the audience, including County Legislator Martha Robertson. George Frantz, the planner consulting on the work, and Debbie Gross, the Town of Dryden's Environmental Planner, were also there. 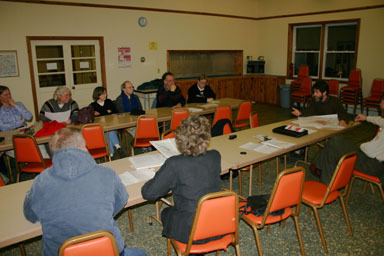 Planning Board members at Thursday night's meeting. There was also a question about minutes, as the recording secretary wasn't present, and the Planning Board minutes haven't been published since 2001. The meeting was recorded, however. After some brief questions about whether to proceed with discussion, the conversation began as a "subcommittee meeting". Most of the questions were about the details of the planning for hamlets in the Draft Comprehensive Plan. Figure 5-1, the Future Land Use Plan (301KB PDF), shows hamlet areas in yellow and doesn't make any distinctions inside of that yellow. That yellow refers to an area where "the residential development density proposed for the hamlet areas is an average of 8 dwellings per acre", a significant-feeling jump in density, perhaps even more in Etna than in Varna. A lot of the discussion revolved around managing such a jump. David Weinstein had earlier proposed changing that to "a maximum of 4 dwellings per acre", which is a rather different thing. As Debbie Gross pointed out, it's not just the difference between 4 and 8, but the use of "average" versus "maximum". I've suggested that the existing language "seems like an invitation to turn Varna into a collection of apartment complexes and duplexes like the 'Lucenteland' zone". There were a lot of options, which aren't currently in the plan, for controlling such development. Many of them revolve around how the plan is implemented iin zoning. Rather than simply allowing dense development in the hamlets, the zoning could either require a special permit for such building - which is not hard to get - or use zoning that is less dense and require developers to request rezoning if they want to build dense developers. The special permit approach places the burden on the town to say why a given development is not appropriate, while requiring rezoning places the burden on developers to explain why a development would be appropriate. The latter approach gives the town far more control over its own destiny. Managing the balance of rental and owner-occupied property was another large question. 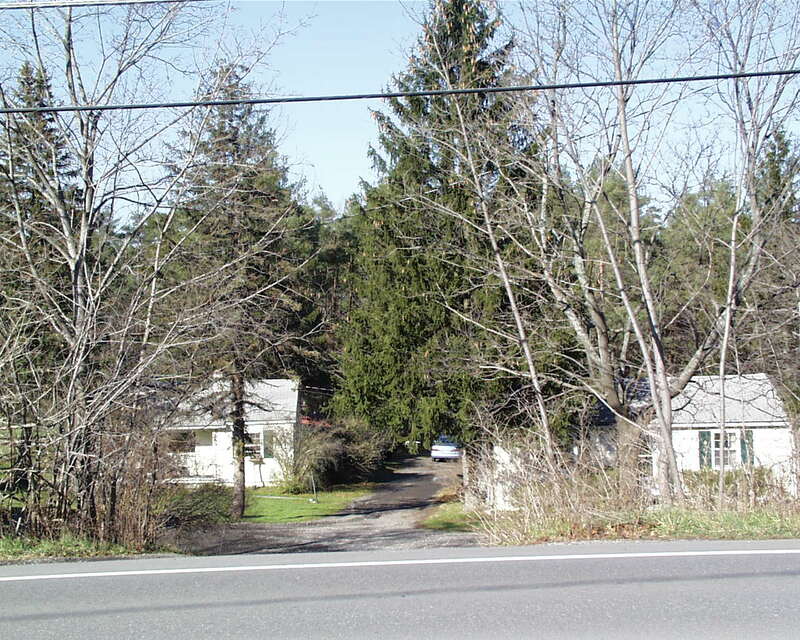 The plan already notes on page 40 that "in Varna the lack of maintenance of rental properties owned by absentee landlords is resulting in the appearance of blight," and Etna residents didn't want that blight spreading to their hamlet. Again, it seems that there are things that can be done through zoning, and which could be recommended by the Plan, which aren't there at present. Mixing commercial with residential uses was another key question for the hamlets, as growing the hamlets into more village-like places is a lot of why higher density in being proposed. Dropping a McDonald's into Etna or Varna might provide a restaurant, for instance, but it would also drastically change the place, likely attracting new traffic that wouldn't necessarily have been there anyway. George Frantz had suggestions for controlling the kinds of business in a given area with maximum setbacks from the road and bans on drive-throughs, reducing the impact of massive parking lots out front and cars passing through. Architectural design issues also came up, in large part because recent developments don't really look like anything that was in the hamlets before, making the distinctions between new and old more jarring. Frantz suggested that style requirements for new construction was a possibility for minimizing these problems. Such requirements wouldn't apply to single-family homes (unless perhaps a hamlet became a historic district, which seems unlikely), but they could preserve the overall look of the hamlets. Frantz noted that he'd spoken with Varna Community Association board chair Mike Richardson about the possibility of having Cornell students work on a charrette, inviting community members' input for producing detailed architectural drawings of possible looks for the hamlets. Late in the meeting, there was some discussion of the Etna Etna Industry / Office / Research Area along Route 13 and Etna Lane, with general consensus that it might better be reduced to include only the current Aramark facility, itself a recipient of a special permit. 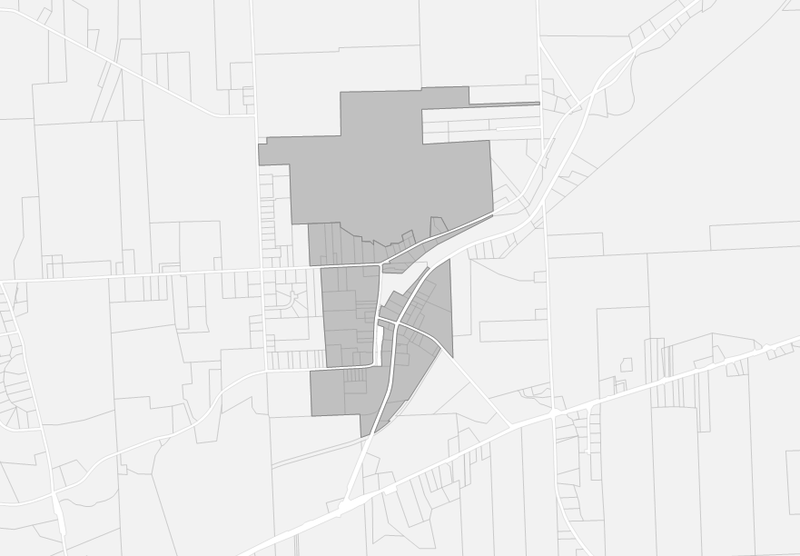 Other areas in the Route 13/366 overlap are already zoned for industrial use, and have far fewer residents. At the same time, the plan may try to keep a barrier of green along Route 13 that separates the "Ithaca" area from the "Dryden" area. For something officially not a meeting, there was a tremendous amount of conversation, extending beyond the Planning Board's normal 9pm meeting conclusion. Hopefully the next few meetings will have the same level of conversation but better attendance. The Journal also has a letter today from Nicholas Hyduke of Dryden, noting how, "as naturally as plants grow toward the sources of light energy, politicians and candidates for public offices grow toward the source of cash energy." This week's sort-of Planning Board meeting on the Draft Comprehensive Plan's impact on Etna and Varna left me wondering about how many people actually live in the hamlets and what we data was available about them. In particular, the rental/owner-occupied question comes up regularly. In Figure 5-1 of the Draft Comprehensive Plan (301 KB PDF), Etna looks like the picture below. The "hamlet" portion this calculation is about is just the yellow. 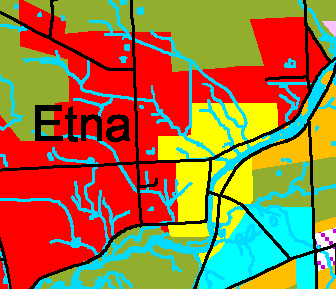 The hamlet area of Etna, as defined in yellow by the Draft Comprehensive Plan. 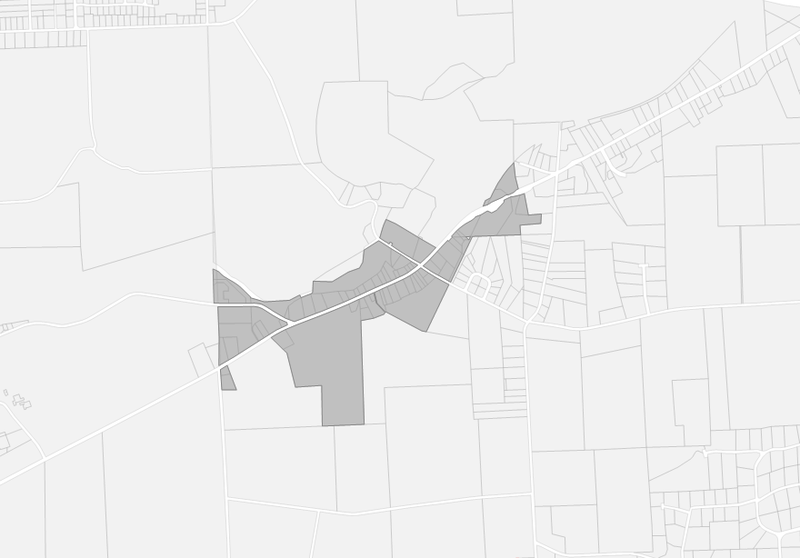 Census blocks which include the hamlet of Etna as defined by the Draft Comprehensive Plan. 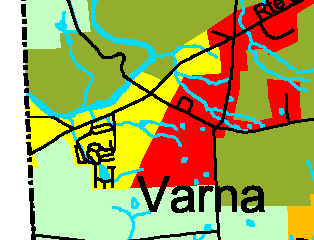 The hamlet area of Varna, as defined in yellow by the Draft Comprehensive Plan. 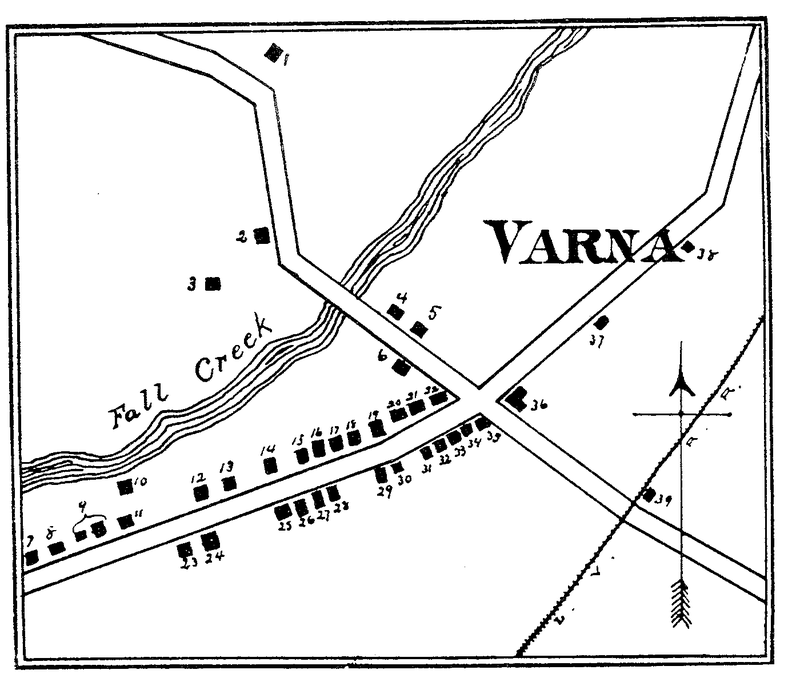 Census blocks which include the hamlet of Varna as defined by the Draft Comprehensive Plan. Neither of these is perfect, but I think this is the closest possible approximation given the shapes of the blocks and the hamlets. The census block version of Varna includes a lot of empty Cornell-owned land, but that shouldn't affect the totals. One issue worth pointing out here is that it's not entirely clear how the census accounts for mobile homes which are owned by their occupants but which are in a park with fees. So far as I can tell, these are counted as owner-occupied, not as rentals. The next step will involve figuring out density, which will mean working with a different map to calculate acreage of the properties in these hamlets without Cornell's experimental fields or the Plantations. "the residential development density proposed for the hamlet areas is an average of 8 dwellings per acre." By my calculations, explained below, downtown Varna has an overall density of approximately 2.56 units/acre currently. At its densest southwest corner, using figures tilted to produce the highest possible density, it has a density of about 5.2 units/acre. Downtown Etna, which is harder to calculate, has a density of about 1.33 units/acre. Getting these numbers is tricky. The choices that the U.S. Census Bureau made about census blocks map pretty badly to the yellow "hamlet" areas in Figure 5-1 of the Draft Comprehensive Plan (301 KB PDF). 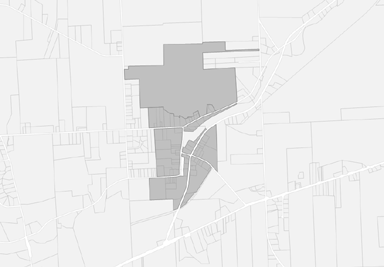 To calculate areas more precisely, we'll turn to a different source of data, the Tompkins County tax parcels map. Etna's density is difficult to calculate this way because the yellow in the Draft Comprehensive Plan map cuts across a 170-acre parcel in the north of Etna. 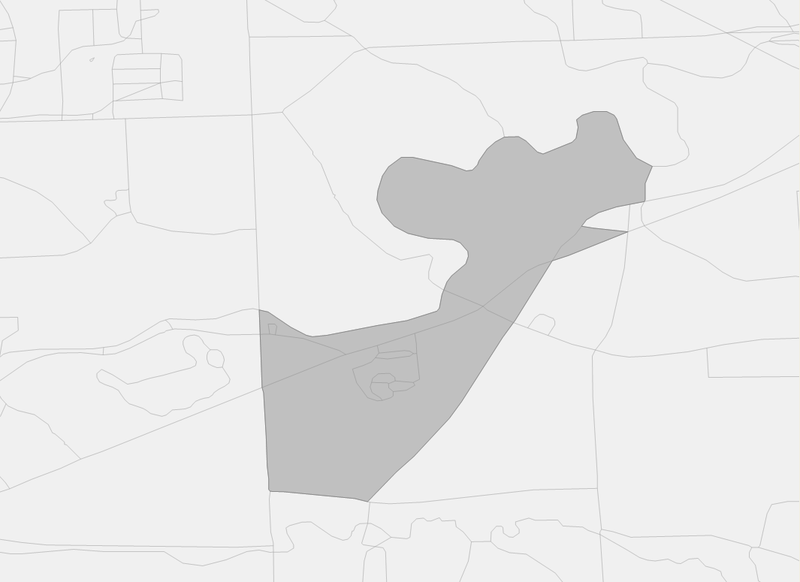 Tax parcels which include the hamlet of Etna as defined by the Draft Comprehensive Plan. Leaving out that parcel at the top, Etna has an area of 136 or 129 acres, depending on which measurement in the tax parcel map you prefer. To come up with the largest density, we'll use the small acreage figure, so 172 housing units divided by 129 acres is 1.33 units/acre. Varna is easier to calculate, as the yellow hamlet area in the Draft Comprehensive Plan maps more easily to tax parcels, as shown below. 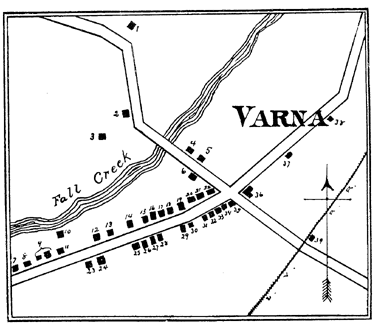 Tax parcels which include the hamlet of Varna as defined by the Draft Comprehensive Plan. This is a smaller area than the census map, but it also includes far less uninhabited acreage, so should produce a higher density. In this case, the total acreage is 156 or 150, depending again on your preference in acreage calculation. Dividing the 385 housing units by 150 acres produces a density of 2.56 units/acre. 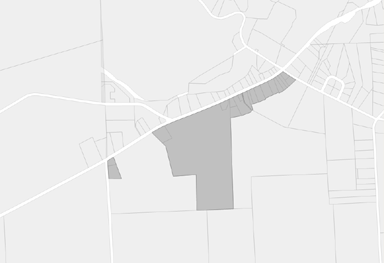 One corner of Varna, its southwest corner, is much denser than the rest of Varna because of the Hillside Acres mobile home park. I decided to see just how dense this area was to get an idea of the maximum density within Varna. The census blocks here combine very small pieces inside the park with a huge section including its edges and houses along 366. Census blocks which include the densest part of Varna. Tax parcels which include the densest parts of Varna. All of these densities are considerably lower than eight units per acre. Update: I'd originally missed a 1.3-acre parcel (a small apartment block) on the left edge along Game Farm Road. That changes the acreage from 51.95 to 53.26, and the density from 5.3 to 5.2 units/acre. I've updated the numbers in the story to reflect this. Today's Ithaca Journal features a letter by Arthur Berkey, Town of Dryden resident and member of the Ithaca City School District Board of Education examining district policy on absences, leaves, and coaching appointments. Although it notes in the first paragraph that it isn't directly about soccer coach Terry Habecker (also a Dryden resident), it does provide background information for that series of letters. The Ithaca Journal reports that there was a party for dogs adopted from research labs on Sunday. The party was at Kiwanis Hall at 4-H Acres on Lower Creek Road, which is in the Town of Dryden, not the Town of Ithaca as the Journal reported. The Ithaca Journal reports that Bret E. Neff, a volunteer firefighter in the Harford fire department, was pinned between two tanker trucks and killed yesterday at a fire in Slaterville Springs. Neff, of Dryden, was 37. The fire, at 395 Buffalo Road, was called in by a Brooktondale volunteer firefighter. The Slaterville Springs fire company responded, assisted by Varna, Richford, Speedsville, Brooktondale, and Ithaca. Frozen ponds complicated fighting the fire, and Neff was filling a portable pond when a Harford tanker truck rolled back. The Ithaca Journal has two stories on New York State's releasing the "most improved" list of schools whose test scores have increased, the first a more general story that looks at schools around the state, the second a close-up on the local schools in the list, including Dryden Elementary School for fourth-grade math. In Dryden, grade 3-5 Principal Doug Premo "said he could attribute the increases in part to the use of a new math curriculum. The school phased in a curriculum called Everyday Mathematics with the kindergartners in 1998." This seems to be the same curriculum that was the subject of recent controversy on the editorial page of the Journal, with Dryden resident Kathy Zahler defending its testing and use. Dryden Elementary School students have gone from 59% passing in 2000 to 88.7% passing in 2003, with "the first group that has had the program all the way through" taking the test last year. Math nights and homework instructions for parents may also have helped. Fernando de Aragon, the Executive Director of the Ithaca-Tompkins County Transportation Council, will be speaking at the Varna Community Center (map) tonight at 7:30pm. As reported earlier, the talk will examine how to slow traffic for safer roads even when the state Department of Transportation is unexcited about lowering speed limits and extra enforcement is expensive. Whether the roads on which you live and travel are large or small, Aragon has suggestions for making them safer. I saw Aragon give an earlier presentation in West Danby, and it was an excellent conversation, well worth the trip there. Last night's meeting on "Speed Control on Rural Roads" at the Varna Community Center was very different from a similar meeting in West Danby, but brought up lots of issues specific to the Town of Dryden, especially Varna, Etna, and the Ellis Hollow area. About twenty people attended, mostly from southwest Dryden, though Bruce Brittain of Forest Home was there, as were two men from Waverly and Barton. Fernando de Aragon, the Executive Director of the Ithaca-Tompkins County Transportation Council, started by talking about the role of his organization, which funnels federal money to local projects and supports studies of traffic patterns and situations. The ITCTC isn't the highway department; it's a metropolitan planning group that's required by federal law since the Ithaca area contains over 50,000 people in areas considered to be "urban" by the Census. The two VCA copies of the Draft Comprehensive Plan were in the room, and a lot of the early conversation revolved around that plan and process. While Aragon cautioned that there isn't much you can do to change state roads, especially roads like 366 where it feels built for speed, he emphasized that even for these kinds of roads, there may be some hope thanks to projects like the state DOT's Context-Sensitive Solutions (CSS). While it will probably be a decade before the state reconsiders the construction of Route 366 (as part of regularly scheduled maintenance), the area should be ready with plans when that happens. The Comprehensive Plan would be one part of that conversation, and issues like planned higher density for Varna could have an impact on road construction. Aragon also pointed out that the Village of Dryden had gotten sidewalks and lights out of the recent Route 13 construction there, and that it's a good time to be asking for change. Aragon urged residents to "take this comprehensive plan process in earnest. It's an opportunity for you." It wasn't clear how much information on roads should go into the Comprehensive Plan or how much weight the DOT would give it, but it was something to focus on. "The good news is that I always thought that Varna has some very interesting points in its favor; they have to do more than anything with its location. How close it is to the activity centers of Cornell and the city... the plus in that is that you're close enough that you can talk about having other ways of getting to those places, which are big destinations, and also of having... park and ride activity happen, if it can happen on the outside of the hamlet. You can capture the traffic out there and move it through here in a more concentrated way, a more efficient way." One other possible advantage Aragon noted for Varna was the prospect of a trail from Freeville along the old Elmira Cortland & Northern rail bed, as noted in the Draft Comprehensive Plan's Future Park & Transportation Improvements map (300KB PDF). Given that trail, if it connected to the East Ithaca trail, and the short distance from Freeville, bicycle commuter traffic is a real possibility. There were some tough questions about a chicken-and-egg problem with the DOT and Varna, as the state will likely only modify the road if there's substantial population density on it, but achieving that density is more difficult when houses are right next to the road and declining. Aragon suggested gateway treatments and landscaping as possible ways to help the situation, but it's plainly not going to be easy to get the state DOT to change the road. As he said, "they have their interest in keeping 366, like most state roads, to serve a regional purpose of mobility, and freight traffic, and they don't want the traffic slowed down." A few other possibilities for slowing down traffic, like planting shrubs closer to the road (trees are prohibited for safety reasons), leaving trash cans right on the white line, or changing lane painting - with narrower lanes or lines that shift to put curves in the lanes even when the road is straight - were also options. Beyond Varna and 366, there were lots of questions about Ellis Hollow and Turkey Hill Roads, especially the intersection of Ellis Hollow, Turkey Hill, and Quarry Roads. Apparently the county had few records of accidents there, but the Varna Volunteer Fire Company did, and Natan Huffman presented those records. The county is planning how to change the intersection, probably with additional signage and possibly flashing lights on the Turkey Hill side of the intersection. There were also concerns about Ellis Hollow Creek Road, especially the intersection with Genung Road, and Jack Bush, Dryden Highway Superintendent, suggested that he would take a look at it, as they're town roads. 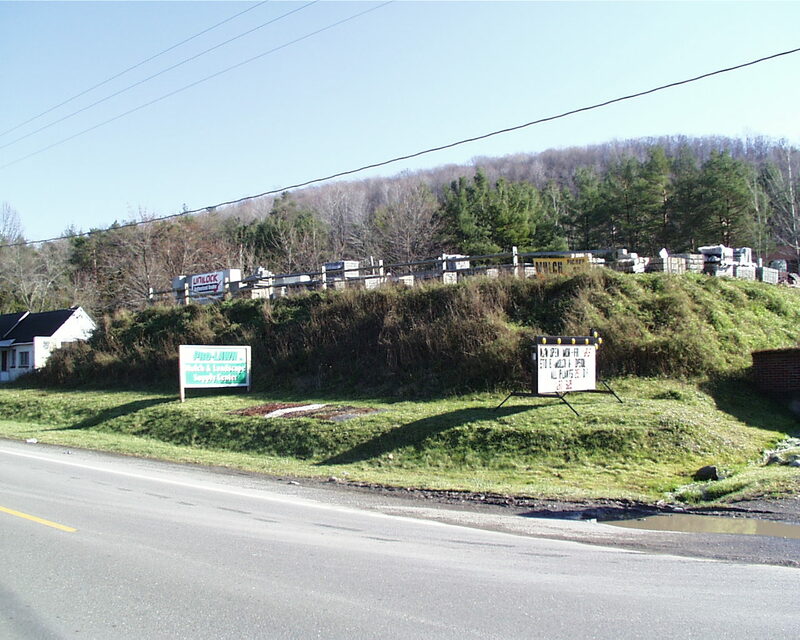 County Legislator Martha Robertson described talking with the state DOT and asking them to reduce the speed limit there from the default of 55, and being told that it would lead to tailgating on this generally empty road. Another issue that came up was road reclassification, especially amid concerns that reclassification was a first step toward ever-larger roads. Turkey Hill Road between Route 366 and Mt.Pleasant Road, for instance, is being reclassified from a "Local" road to an "Urban Collector", though this has more to do with its being in an area the 2000 census has classified as "Urban" than with any changes to the nature of traffic on the road. Fernando de Aragon presents the Ithaca urbanization map at the Varna Community Center. While some of the distinctions between "urban" and "non-urban" areas on the map seemed arbitrary - my house is not urban, but the forest across 366 from me is - Aragon noted that Varna may be in a better position to ask for sidewalks given its urban status. 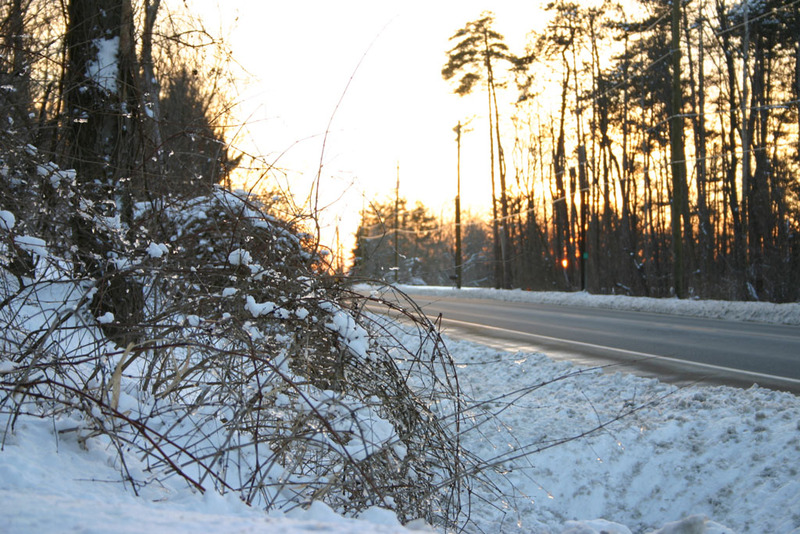 There were a fair number of questions about snow fences, though the central problem with those appears to be the need to have multiple fences and especially fences far from the road for them to work effectively, which creates some major difficulties. The wide variety of questions gave the meeting much less focus than the earlier West Danby meeting, though it seemed to stem from the area simply having more kinds of problems, some of them intractable. On the brighter side, a letter to the editor reminds readers of the Tompkins County Homeownership Program, "providing assistance to help low- and moderate-income individuals and families purchase their first homes." The Ithaca Journal's editorial today reflects on the sacrifices of firefighters, particularly volunteer firefighters who accept risk without pay. While the Journal notes that deaths are thankfully rare (seven nationwide in 2003), "each of us ought to pause a moment today and appreciate the sacrifices and dedication of people such as Bret Neff." The expenditure of $6,800 from the water reserve for Engineering for the proposed George St. project. This expenditure is subject to a 30-day permissive referendum. I had no idea what a permissive referendum was, but here's an explanation. Village residents can request a referendum on the measure if they present a petition containing signatures of 20% of local electors. For a town, it would be "a number equal to at least five per centum of the total vote cast for governor in said town at the last general election held for the election of state officers, but which shall not be less than one hundred in a town of the first class nor less than twenty-five in a town of the second class". The rules for determining town class are odd, but I think Dryden is likely a first class town as it has a population over ten thousand. At the county level, it would have to contain signatures of no fewer than 10% of the number of votes cast in the last governor's race in the municipality. The Ithaca Journal reports that hundreds of firefighters from four counties paid their respects to Bret Neff, the Harford firefighter killed at a fire earlier this week, at the Perkins Funeral Home in Dryden. Firefighters marched through the village, led by a fire truck and accompanied by bagpipes. The Ithaca Journal reports on last night's joint meeting between the boards of the Town and Village of Dryden. The village provides services to about 5000 people in the town, including the Dryden High School complex and TC3, as well as to approximately 2000 of its own residents, but the contracts are ambiguous and the village needs to upgrade its facilities. There's also a problem on the TC3 campus, where groundwater enters the system. According to the Town's Notices, "Following the meeting with the Village Board of Trustees, the Town Board will reconvene at 65 East Main Street to discuss the annexation petition of Konstantinos Katsiroumbas." The Journal hasn't covered this meeting, but hopefully minutes will be available at some point. I didn't make it to this month's Town Board meeting, so I was especially interested to see the minutes which recently appeared. As a number of issues were discussed at different points in the meeting, the summary below attempts to cluster information by subject rather than time. Peggy Walbridge asked about the status of the work being done on Hunt Hill Road and noted her concern that the previous meeting seemed to be more of a rush to finish than to gather citizen input. She noted that this work has been the subject of "four years of discussion" and concerns from citizens that the highway department may embark on "perhaps not a good way to rebuild the road." He [Crawford] said that with issues such as affordable housing that are being addressed, and an eye toward accommodating people who might want to live here and give them reasons to move here as opposed to other competing communities, and asked whether legislation like this might put Dryden and Tompkins County in the news in a little bit different light to an extent that this is radical legislation. There was extended conversation during the County Briefing about the county's amending the discrimination law to prohibit discrimination on grounds of gender identity, with Councilmen Michaels and Hattery leading the charge against it. Michaels seemed most concerned about its impact on business. Hattery was concerned about subpoena powers and that "without any restrictions on those kinds of broad powers there is the potential to infringe on other citizens rights in an attempt to protect other rights", about which County Legislator Michael Lane said he (and James Crawford earlier) was incorrect. The subpoena powers are the same as they were for other forms of discrimination and go through the county attorney's office, not investigators. Hattery "doesn't have any confidence that there are adequate boundaries on the abilities of the human rights investigators or the county attorney." Bernie Thoma of Thoma Development Consultants presented his company's services as a possible means of getting additional funding for the town, through their grant writing services. Thoma has done work for the Village of Dryden. In the County Briefing, county legislator Martha Robertson noted that the County may also provide grant-writing services at similar fees. The public hearing on Time-Warner Cable's proposed franchise was rather involved. I strongly recommend reading this portion of the minutes, as it's difficult to summarize. Time-Warner hasn't had a contract with the town for six years, and has continued to serve the area under temporary operating authority from the Public Service Commission. The town collects a 3% tax on subscribers (of a possible 5%). There were a lot of questions about bringing high-speed network connectivity to the town hall and TC3, something that apparently fell out of regional negotiations when the City of Ithaca, Town of Ithaca, and Village of Cayuga Heights went for a separate contract. No action was taken. The involvement of the Conservation Board is any review is totally discretionary with the referring body the way it is proposed. The only way the Conservation Board will get to review proposals is if another board explicitly refers proposals to it, though "Developers and/or applicants are strongly encouraged to present their proposals to the Conservation Board for review and comment prior to formally submitting their application." The board also appointed Craig Schutt chair of the existing Conservation Advisory Council. Debbie Gross, the Town's Environmental Planner, reported that the Tompkins County Planning Department is working on its own comprehensive plan for the county, and wanted to hold a joint public meeting with the Town Board and Planning Board, possibly April 15. Gross is getting set up with mapping software and planning training on storm water regulations. There's a possibility of the town sharing her work with the Town of Caroline. She has also done research on renewable and efficient energy "with respect to building a new town hall", and has been preparing a Request for Proposals (RFP) for telecommunications consultants. She has also been working on trail development, and asked if the board would support bringing back the trail committee. Jack Bush volunteered to work with it. The County Briefing followed the public hearing, with Martha Robertson discussing a meeting on the housing shortage and related problems in Tompkins County. The state and federal budgets also seems likely to create additional problems for county finance. She also mentioned the traffic calming meeting held this week. Michael Lane discussed a study on Caswell Road leachate and whether it might be trucked to the Freeville wastewater plant rather than the Ithaca plant, as well as the road re-classification discussed at the traffic calming meeting. The Board then moved to the Highway Department, where Jack Bush requested that the Board change the health care coverage for elected officials, as the rate ($159/week) makes him paid less than his unelected deputy. There was also some conversation about snowplow accidents. The temporary sewer pump on Freese Road is working, and the Board approved a replacement for it at the end of the meeting, using "public emergency" grounds to skip competitive bidding. Jennifer Glaab, the Recreation Coordinator, distributed the 2003 Annual Report for the Recreation Department and reported that two college students were volunteering on projects. The ice rink was running though the lights can't be fixed for night skating, and the Dryden Caroline Drifters Snowmobile Club had groomed the Jim Schug Trail for cross-country skiing. Contra dancing, wrestling, after-school ice skating (at the Rink in Lansing), lacrosse, and baseball and softball are in the works. The board also appointed Tracey Kurtz to the Recreation Commission. Bambi Hollenbeck, Town Clerk and Receiver of Taxes, reported that tax collection was in progress and the Town's warrant to the county was paid. The Board voted to roll over $255 from last year's Old Home Days to this years, and noted that a $1000 gift had been made for the Town Historian. However, Marty Christofferson "said there had been some concerns about the Town Historian and that position has not been appointed for this year. He has spoken with some people that are with the Historical Society and asked them for a recommendation." The Town Board approved the Ithaca Area Wastewater Treatment budget, discussed the possibility of lights for the Meadow Drive and Leisure Lane area, and talked about the computer systems at the town hall, as well as approving an abstract for $154,638.58. There seems to be no mention of the fire company contracts in this meeting. At the January 27 meeting, Councilman Michael proposed "that the Town approve a contract at the February meeting, and if the departments like it they can sign it and send it back." Perhaps negotiations continue. The board did receive a draft report from Sciarabba Walker on audits for all of the fire companies except Etna, but there is no mention of discussion. Also, Neptune Hose has asked the Town Board to hold its April meeting at their department "because they have a presentation and service awards to make". Today's legal notices state that the Village of Dryden unanimously passed the moratorium continuation at the public hearing held last week. 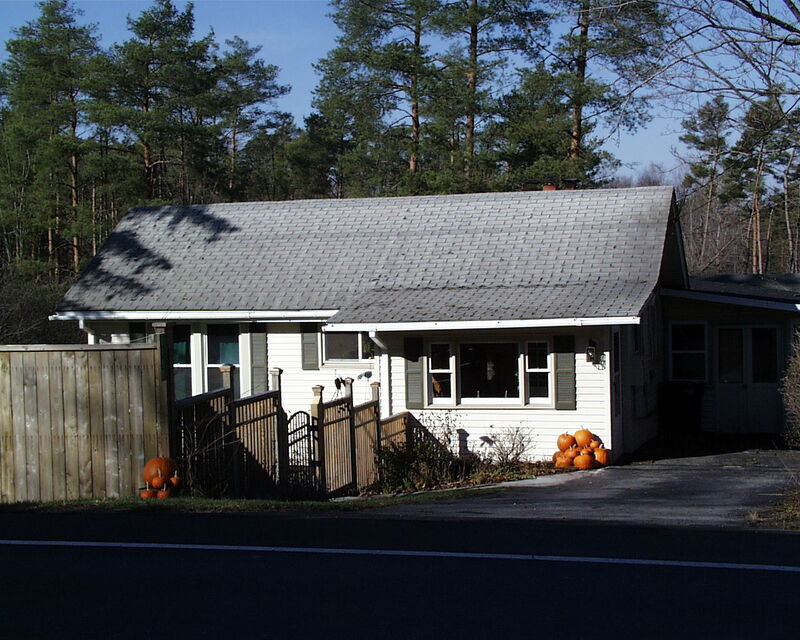 The purpose of this Local Law is to establish an additional six (6) month moratorium on the filing, review and approval of any applications for permits and approvals related to the construction of new multiple residences within the Commercial Business Districts of the Village of Dryden. Such moratorium period is in addition to the currently pending six (6) month moratorium established for similar purposes by Local Law 003 of the year 2003. It is the intent of this Local Law to permit the Village to continue its ongoing review of its Zoning Laws and Comprehensive Plan, including, but no limited to, (i) the appropriateness of various uses of property within areas zoned for commercial and business purposes, (ii) the appropriateness of multiple residences within Commercial Business Districts and issues of public health, safety and welfare related thereto, (iii) the adequacy of existing physical and financial resources of the Village to furnish essential services and facilities, (iv) the effect on the Village's aquifer, and (v) the desirability of additional non-owner occupied properties. 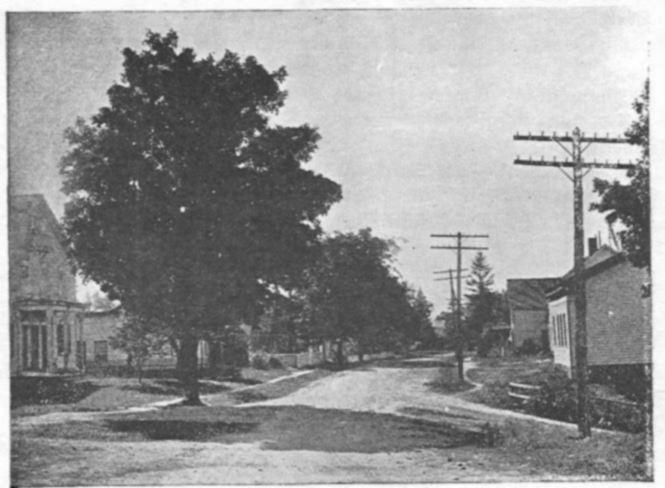 Such review is still underway an it is hereby determined that the additional period of time covered by this moratorium is needed in order for the Village to fully and properly complete its study and review, evaluate the foregoing issues, consider amendments to its Comprehensive Plan and Zoning Law, elicit and consider public comment, and/or adopt additional Zoning Law provisions. Pending completion of all the foregoing, it is the further intent of this Local Law to continue to preserve the status quo. "Bret E. Neff and area volunteer emergency responders" get a laurel from Alfred Kahn of Ithaca in today's Journal. The news of Neff's death at a fire "impels [Kahn] to express to him and to his fellow volunteers what I have already said to many of them privately: Thank you for saving my life; I will never forget my debt to you." Tompkins County postmasters, including those in Dryden, Etna, and Freeville, also get a laurel from the Advocacy Center for their participation in displays coinciding with the Postal Service's "Stop Family Violence" stamp. 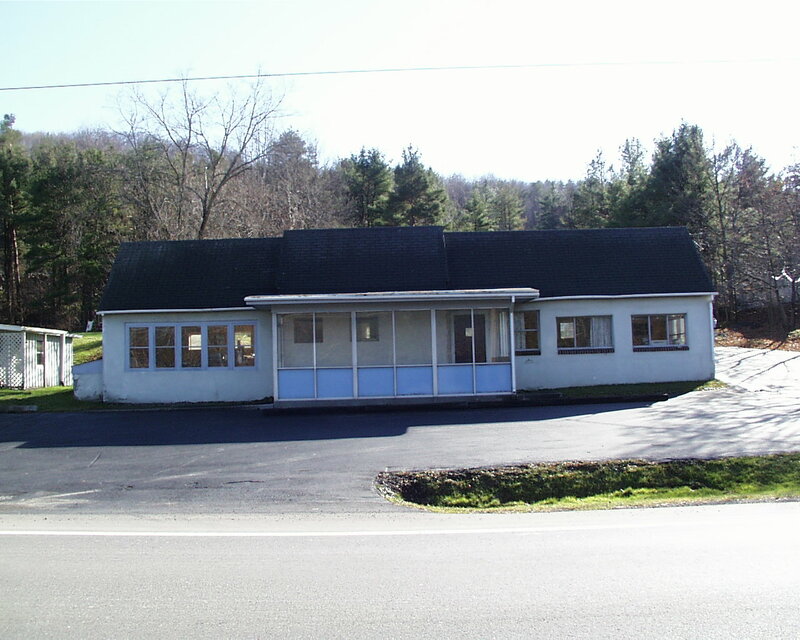 It's been a few weeks since the last photos of Route 366 buildings. 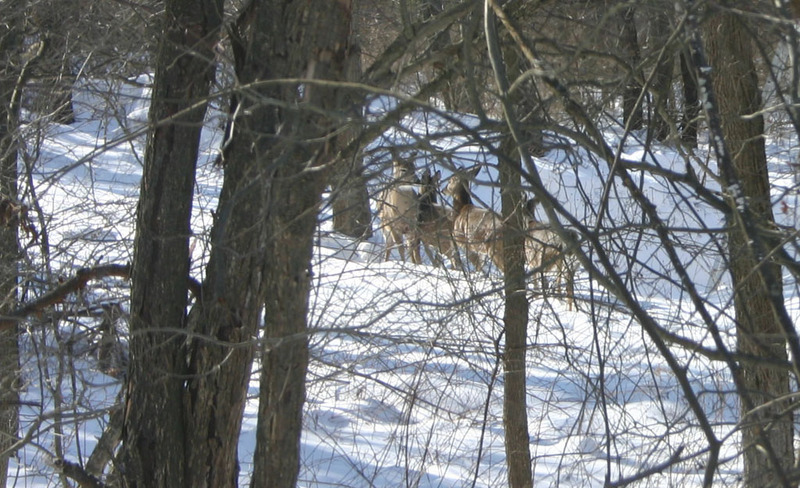 Continuing toward Varna, here are a few more, near the Oakbrook Drive intersection. As noted earlier, the Department of Assessment mailed new Dryden assessments on February 27, and ours is here today. It went up 17.5% for us this year, less than the 23% it climbed last year. Rising assessments, roads filled with 14,000 out-of-county commuters, and questions about how best to develop the town all connect to a common problem: Tompkins County's lack of housing, especially affordable housing. The data makes it clear what the fundamental problem is. There is a shortage of apartments (around 3,100 units) at rents of $250 or below and a large shortage (around 2,500 units) at rents of $900 and above. On the other hand, there is an excess of housing (around 5,600 units) at rent levels clustered around the median rent of $611. The result is that the very lowest income households and the highest income households put pressure on the rental market at the median, thus driving up rents in that range. The Town of Dryden's 2002 median values for houses were in line with the county's, though that doesn't say much about distribution. (The Villages of Dryden and Freeville had lower medians.) 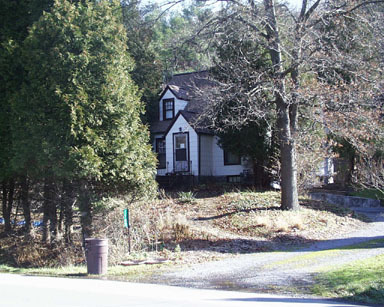 2000 census data, which seems likely to be out of date given the degree of change in recent years, does provide something of a picture of owner-occupied houses for the Town of Dryden, Village of Dryden, and Village of Freeville. All seem to cluster pretty tightly around the median price. 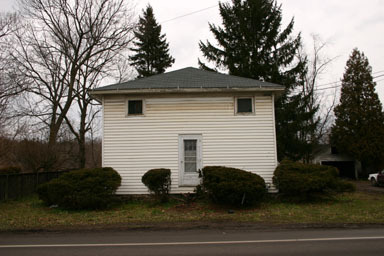 Many of Dryden's houses are older, as looking at the census housing data for the Town of Dryden, Village of Dryden, and Village of Freeville shows. About 21% of the town's housing stock (including my own house) is buildings built before 1939. In the Village of Dryden, 34% of housing is from 1939 or earlier (including 43% of rental housing), while in Freeville just over 50% of housing is from 1939 or earlier (though only 45% of rentals). The census also provides information on rents for the Town of Dryden, Village of Dryden, and Village of Freeville. Median gross rent (including utilities, if applicable) was $544 in the Town of Dryden, $468 in the Village of Dryden, and $547 in the Village of Freeville. Rents in all of these places are fairly well clustered around the medians. For owner-occupied buildings, there's a (not surprising) difference between those paying a mortgage and those who aren't. Again, the census bureau has tables for the Town of Dryden, Village of Dryden, and Village of Freeville. With a mortgage, median monthly owner costs are $1,091 for the Town of Dryden, $1,003 for the Village of Dryden, and $925 for the Village of Freeville. Without a mortgage, it's $435 for the Town of Dryden, $451 for the Village of Dryden, and $335 in Freeville. Except in Freeville, those cluster fairly tightly around the median. The Draft Comprehensive Plan for the town is clearly excited about increasing density by building new housing in the town, and there's a goal (on page 33) of "Provide for a variety of affordable, high-quality housing options for all town residents." At the same time, though, there's not much detail on how to achieve that affordability, especially in a community with a large population of relatively wealthy but clearly transient renters. Page 55 of the plan includes a sidebar on "Some Guidelines for Multi-Family Development", but there's little guidance there on encouraging projects that have low rents or low costs of ownership. It may not be the role of the plan to do this - it may be something that comes in zoning and implementation - but it seems like housing costs are part of the economic foundation on which such a plan rests, and critical to its success. If, for instance, Varna develops densely, but brings more students off the campus and out of the City of Ithaca, then housing isn't likely to be affordable there, and lots of people will still be commuting down 366 to get to their work at Cornell, further increasing the pressure the road puts on the community. I can't find data on who occupies rentals in the Varna area now, but new construction doesn't look targeted to low-income renters. There does seem to be some concern over what affordable housing might bring to the area, and low-income housing in particular has certainly provoked rows in Tompkins County in the past. At the same time, this is a circle that needs to be squared. It hardly seems like that Dryden (or even Varna) will turn into Cayuga Heights overnight, but the prospect of "luxury" apartment complexes and town houses seems to produce decidedly mixed results.